Want to harness the power of aromatherapy when you are away from your home oil diffuser, such as at work, at school, or while traveling? 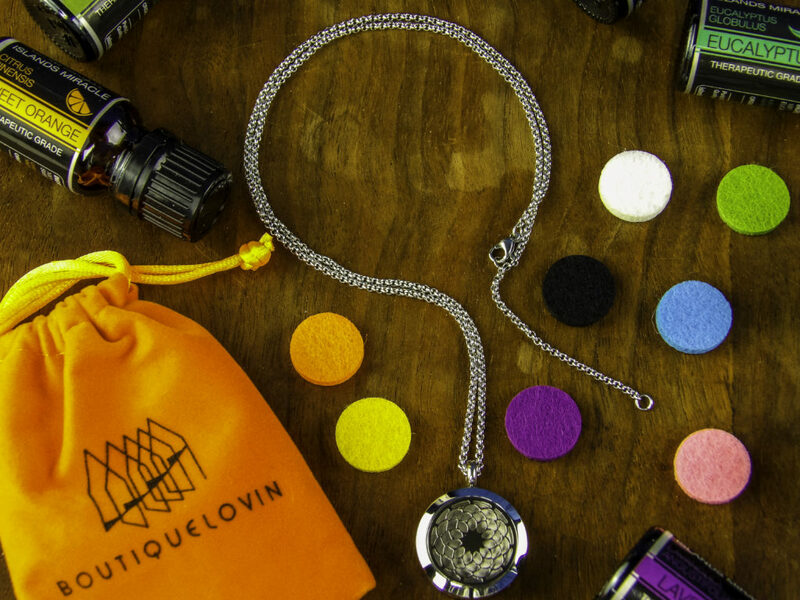 BOUTIQUELOVIN designed a necklace to do just that: it’s an essential oil diffuser necklace that allows for personal aromatherapy wherever you go. Aromatherapy can invigorate, calm, uplift, provide clarity and concentration, dissipate food odors, and energize us. But not all environments will allow a diffuser, including an office, school, library or fitness center. Most essential oils are too powerful to be applied directly to the skin. 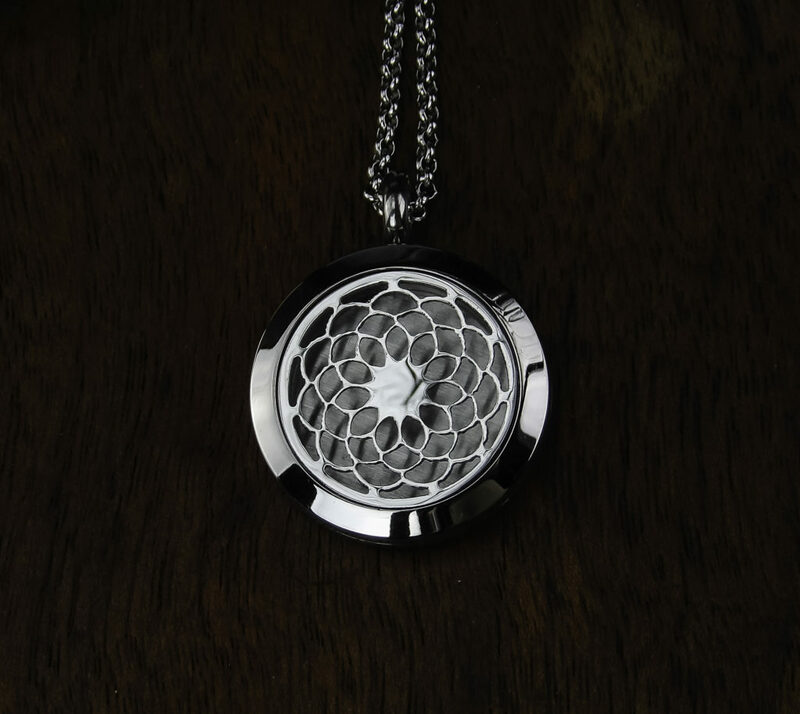 BOUTIQUELOVIN Aromatherapy Essential Oil Diffuser Necklace provides personal and portable aromatherapy without the use of diffusers, electricity or water, yet they provide hours of enjoyment of using the essential oil of your choice. 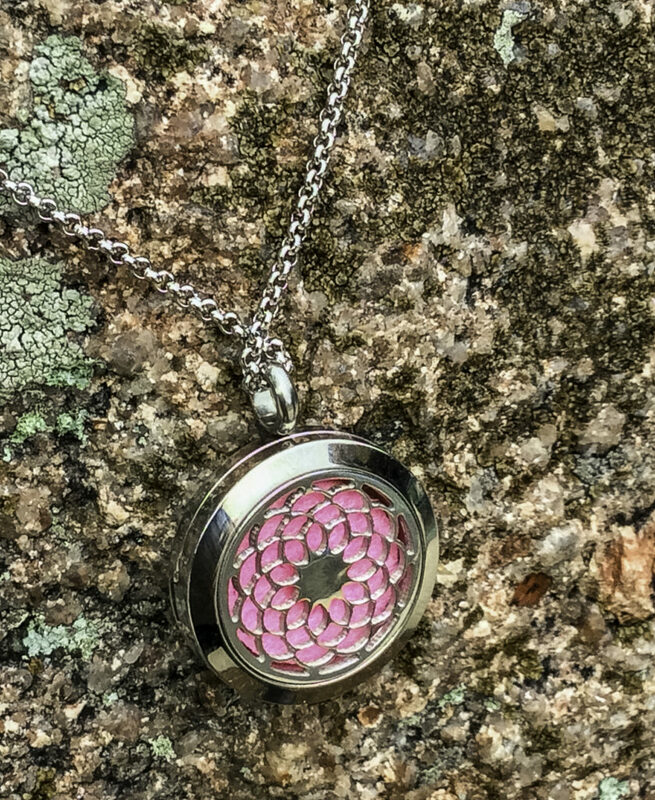 The BoutiqueLovin Aromatherapy Essential Oil Diffuser Necklace is a Stainless Steel Locket with an Adjustable Chain with extender. 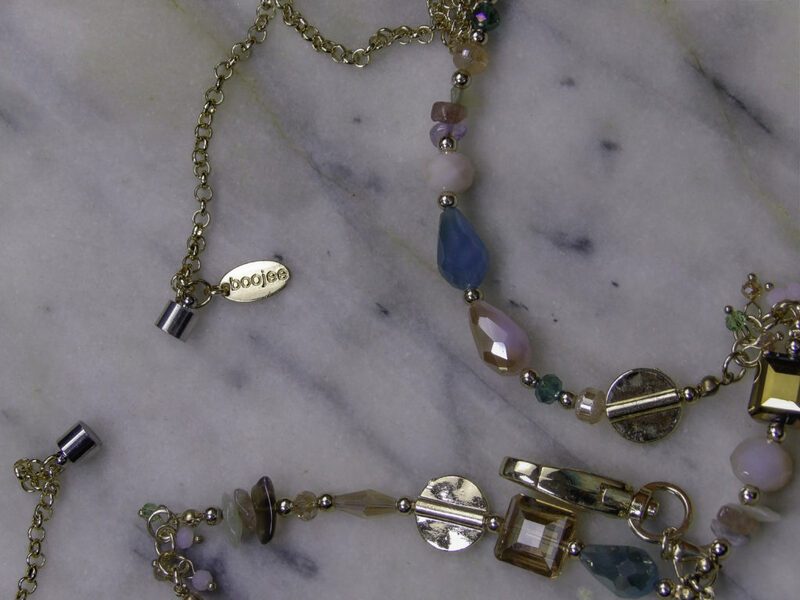 The necklace chain, clasp, and pendant are sturdy with no loose pieces. The hinge on the pocket is solid and well-made. Made from anti-allergy titanium stainless steel for durability. Wear it all the time and it will be resistant to scratches, dents or tarnish. 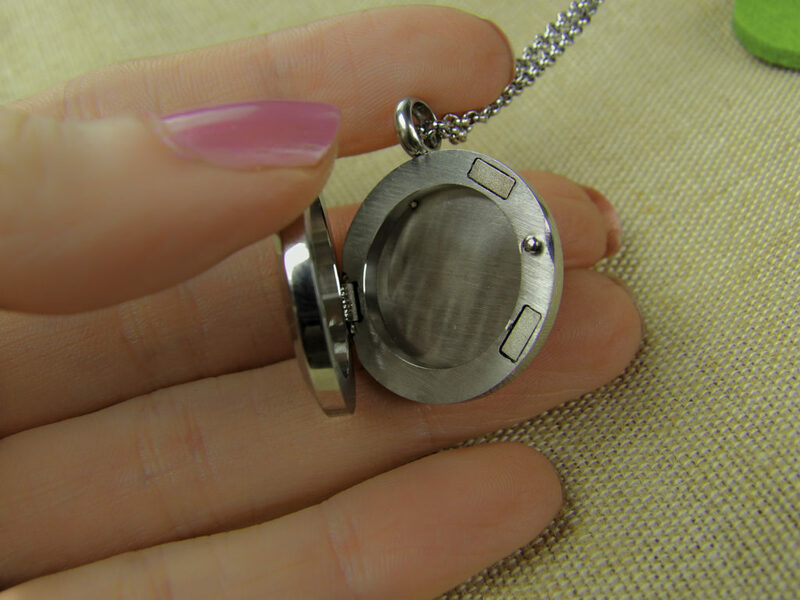 NO LEAK DESIGN: Double magnet closure ensures that the locket will stay closed and the oil-containing pad stays put. 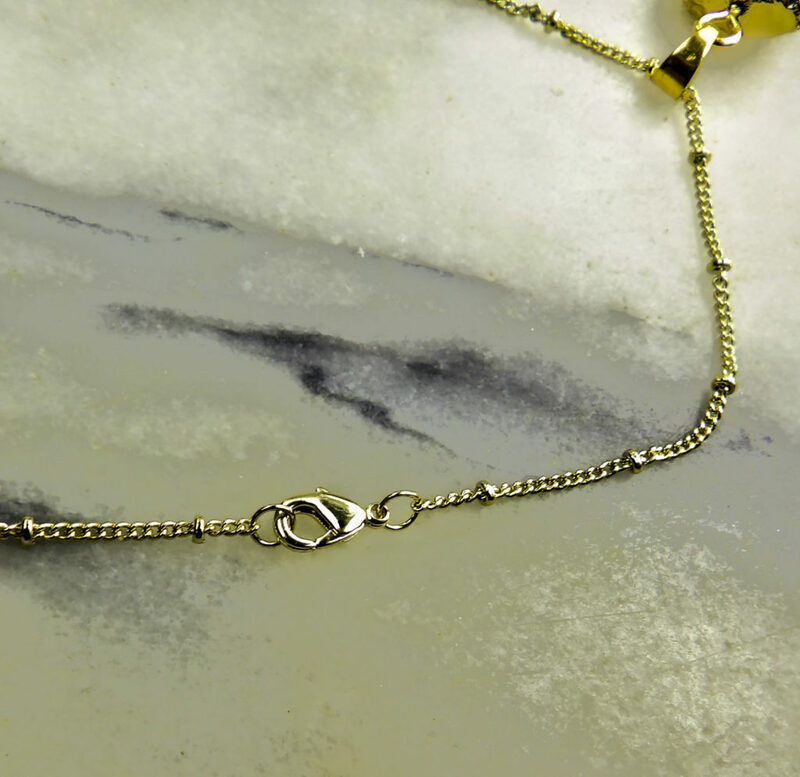 CHAIN LENGTH: Chain necklace measures 20″ with a2″ chain extender. 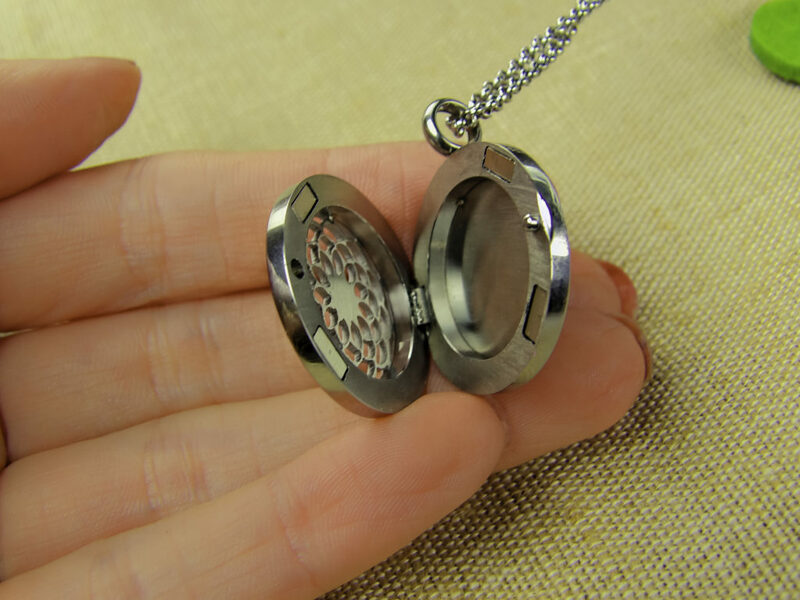 LOCKET SIZE: 1 INCH. Classic while still eye-catching. It also comes with eight colorful and reusable pads to hold aromatherapy oils. Only a drop or two is needed for several hours use. The reusable cloth pad colors are black, white, pink, aqua blue, purple, green, orange and yellow. 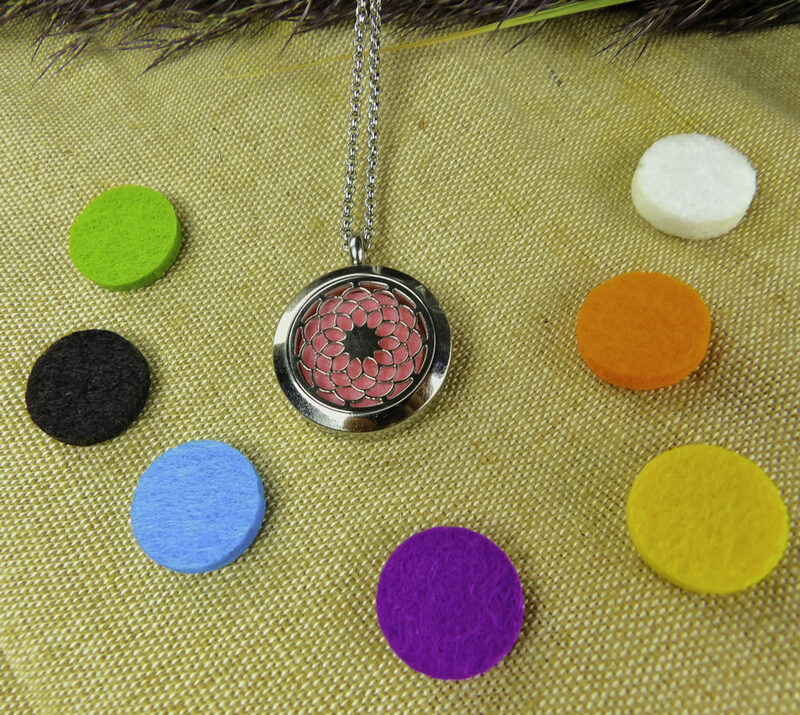 These eight colorful microfiber cloth pads are inserted inside the necklace within the locket chamber of the pendant and serve as a background color to the flower face pattern so they can coordinate with your outfit of the day and look great on a variety of fabrics and textures. They are reusable. Aromatherapy colored pad color options. 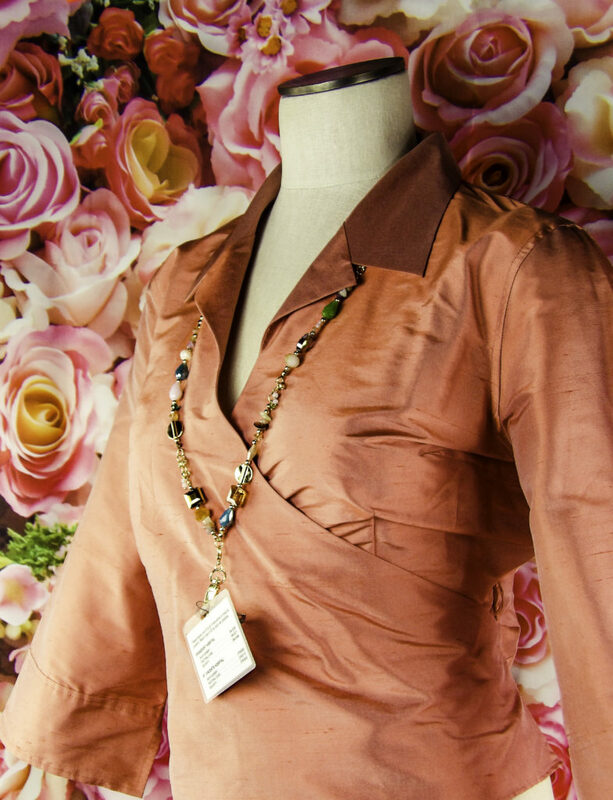 The necklace is a versatile piece that goes with both casual and dressier outfits. Apply the essential oil or oil blend to the pad in your choice of color. You may already have a favorite essential oil or oil blend or can experiment with some of the suggested oils listed below. Going to an outdoor wedding, picnic, or al fresco dinner party and don’t want to smell like bug spray? 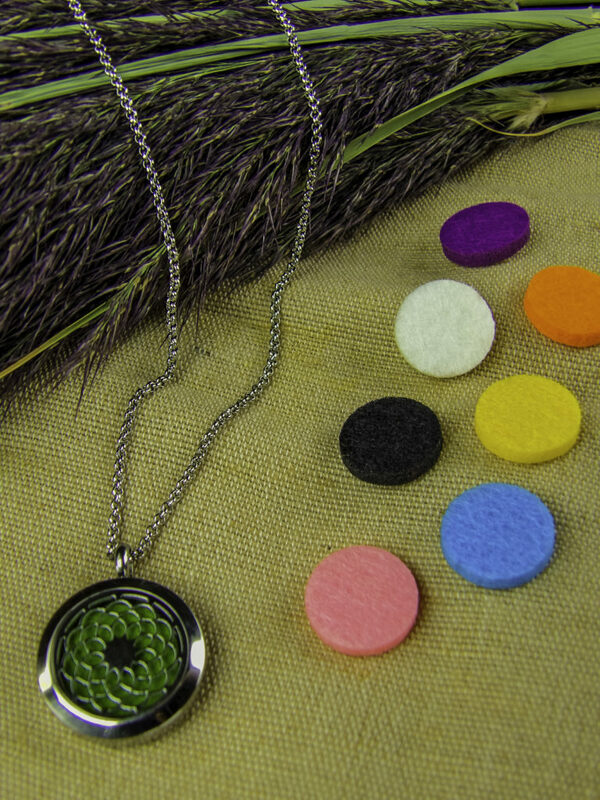 Use this necklace instead to keep mosquitos and other bugs away during an outdoor event. Tea Tree Oil helps deter bugs and ticks, making it particularly useful for camping, hikes, and picnics when constant bug spray is not an option. Rosemary Oil helps with nervousness, fatigue, and mental clarity, especially when under stress, like during a presentation or staff meeting. Some report that diffusing Rosemary Oil helps students concentrate while doing their homework or learning. Peppermint Oil is invigorating and aids with mental clarity. It is beneficial when studying, or concentrating on a project or school exam. Exercise such as Yoga, Pilates, and stretching are enhanced by the uplifting scent of Grapefruit Oil. Grapefruit is stimulating and uplifts the mood. 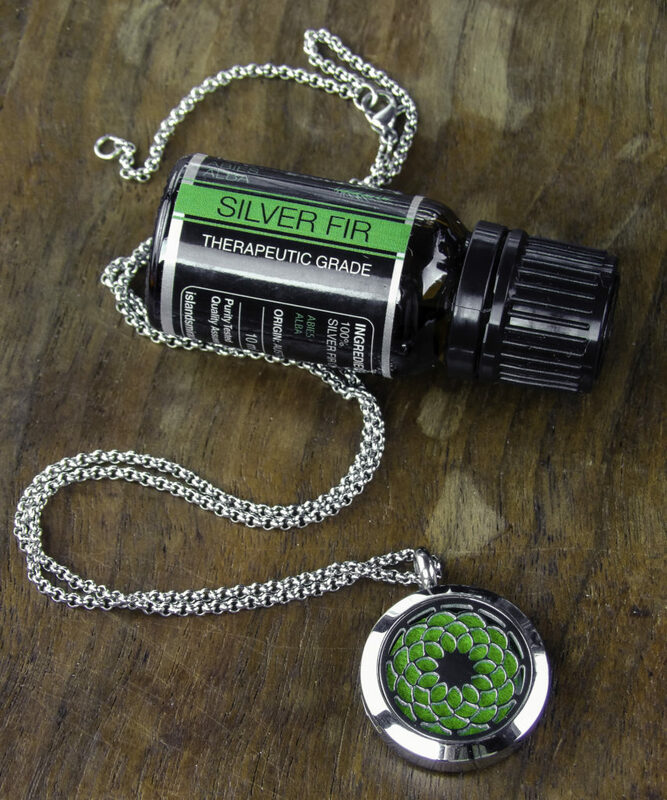 Peppermint or Silver Fir is also invigorating during a workout. 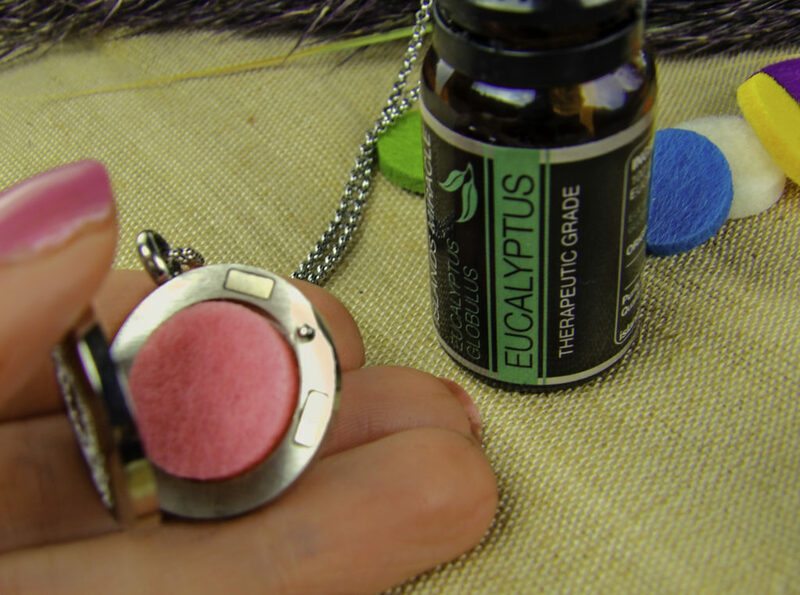 Eucalyptus essential oil is helpful for congestion, and is helpful in dry offices allergy season, or if you are coming down with or recovering from a cold. 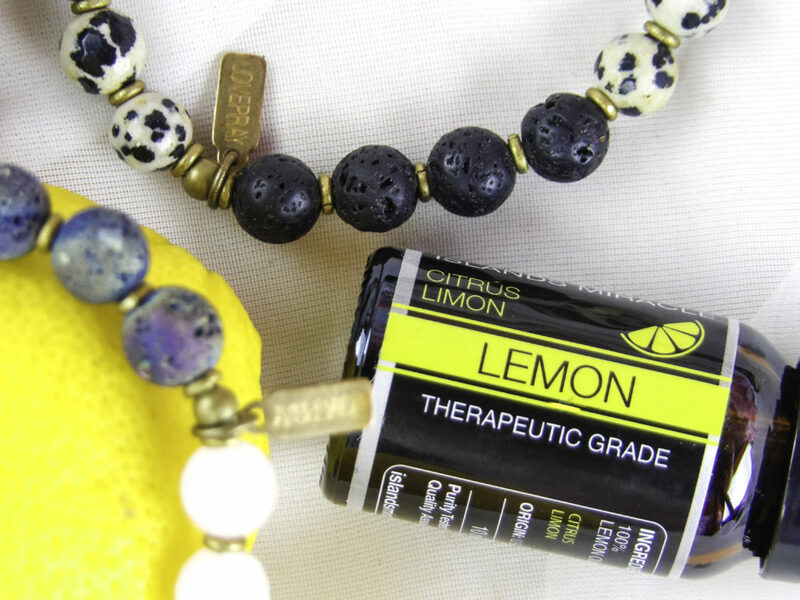 Lemon is invigorating, smells clean and is considered a universally liked scent. Did you eat something strong smelling for lunch such as fish or a spicy meal, or did you eat something in a restaurant or cafeteria with a strong lingering smell, perhaps a fast food restaurant with a grill? Peppermint Oil can overcome pungent foods smells and even second-hand cigarette smoke odors that can permeate your clothing. 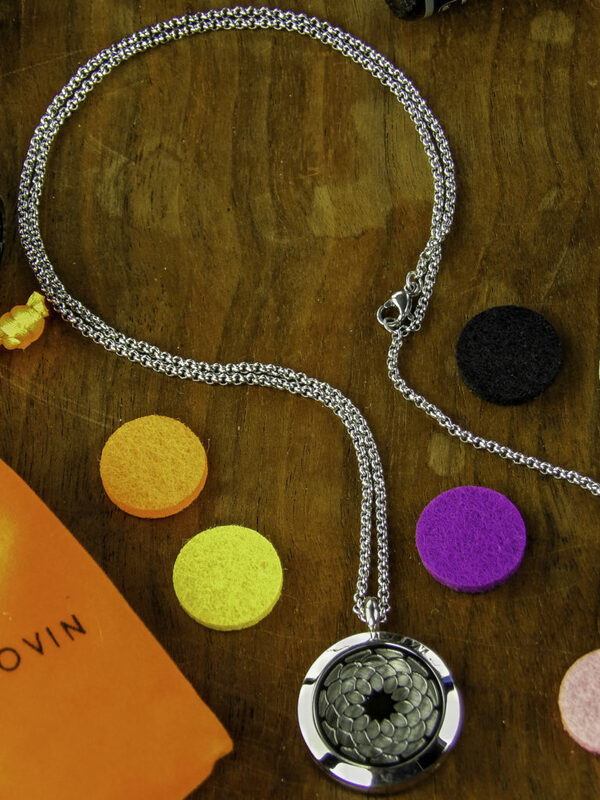 The BoutiqueLovin necklace comes in an attractive and useful drawing velvet bag with the BoutiqueLovin logo. It is sturdy and attractive. 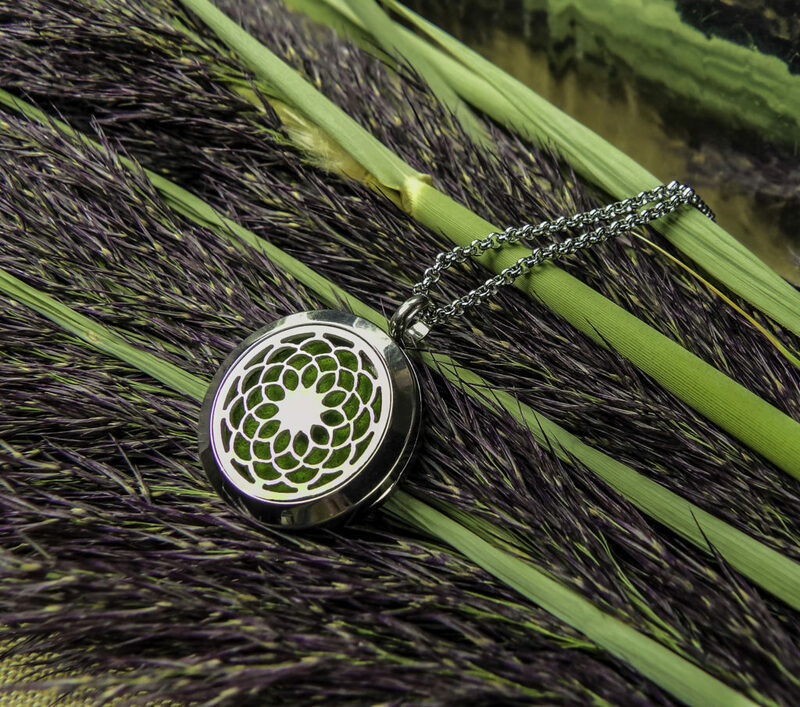 A durable, well made and attractive piece that compliments many outfits, an aromatherapy necklace provides the power of aromatherapy on the go! Choose the oil or oils of your choice for work, school, exercise, as a bug repellent at outdoor events, or for a personal fragrance. A lovely gift for an aromatherapy lover. 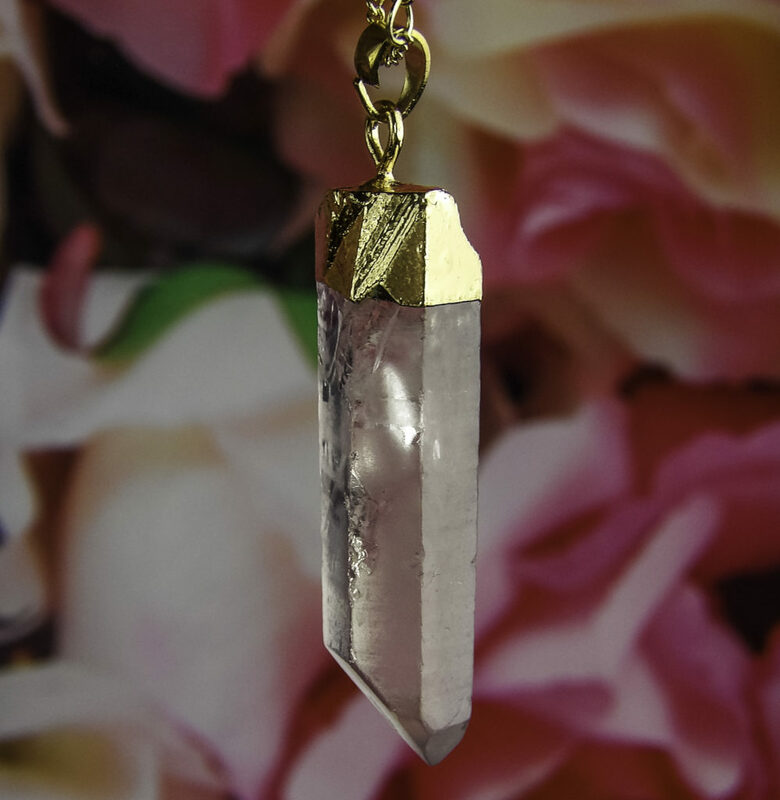 Love natural quartz crystal stones and want to incorporate them into your jewelry collection to add some boho chic? Do you like the variance seen in one-of-a-kind natural elements that have unique, distinctive features? 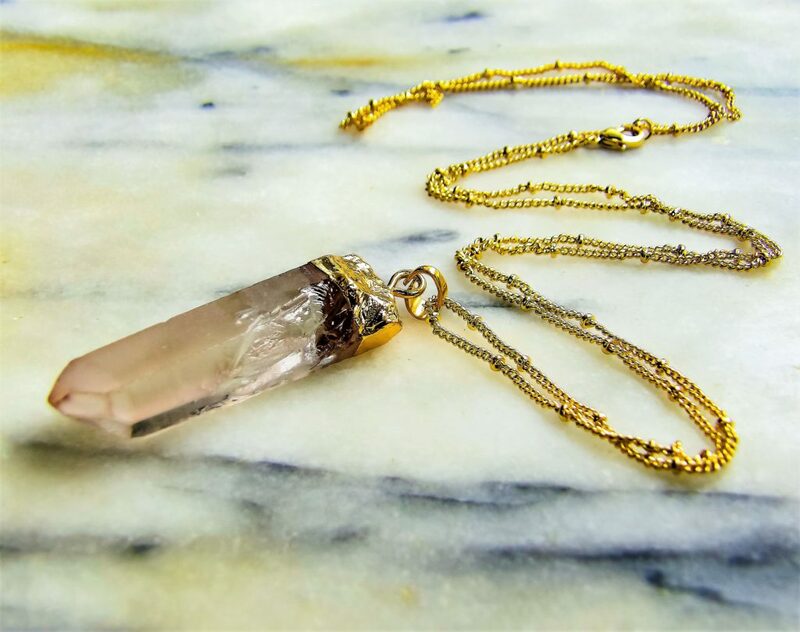 The BOUTIQUELOVIN gold dipped raw clear Quartz Gemstone crystal pendant necklace has a large focal piece raw crystal with natural variances in its’ shape and texture and floats on a 30-inch chain. Ideal for gift giving or for yourself. 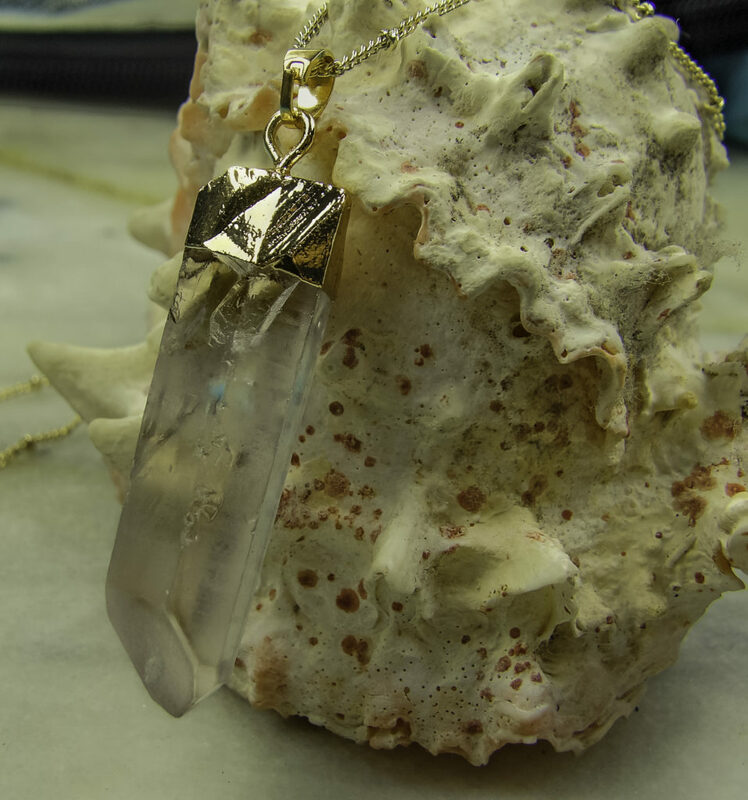 The pendant is a large clear raw quartz crystal pendant with a gold dipped copper fastener band. The larger size of the quartz crystal looks visually appropriate and proportion for the longer, 30-inch drop. Each raw crystal is unique, slightly different in cut, size, and shape and each has natural structural variances or inclusions that add character. 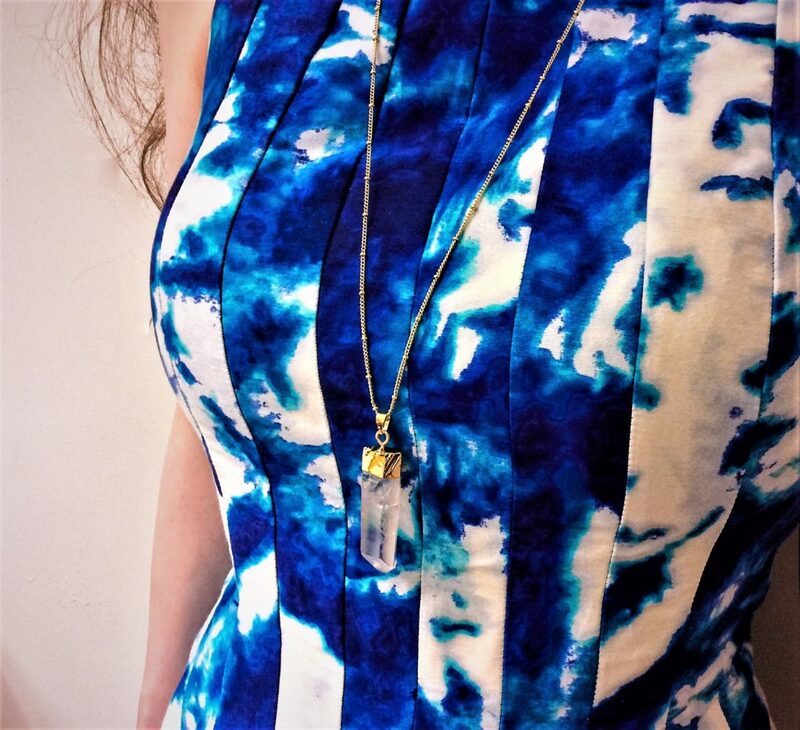 CRYSTAL PENDANT: A large focal piece such as this raw crystal quartz looks visually proportional with “big” design elements such as bold colors and large prints. 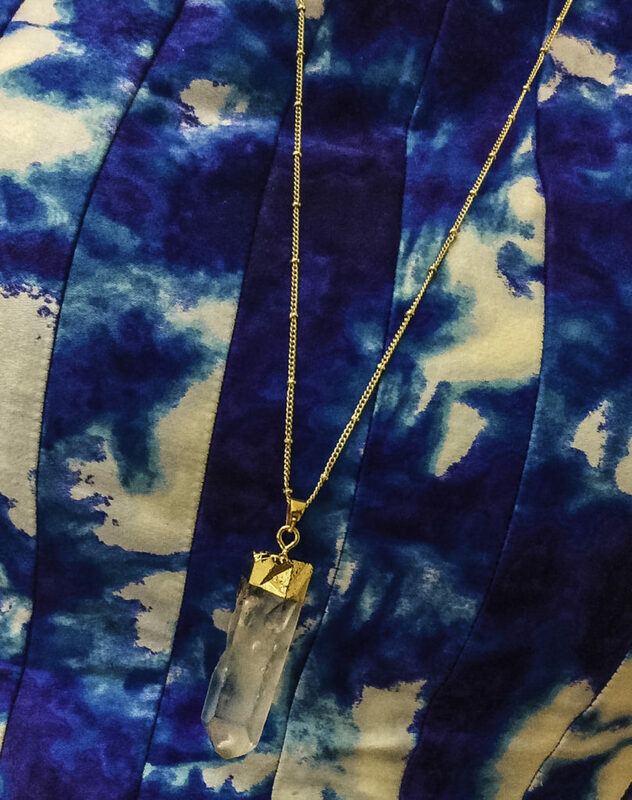 The raw crystal reflects the colors in the outfit in an impressionist look, making it a very versatile piece to compliment many outfits. 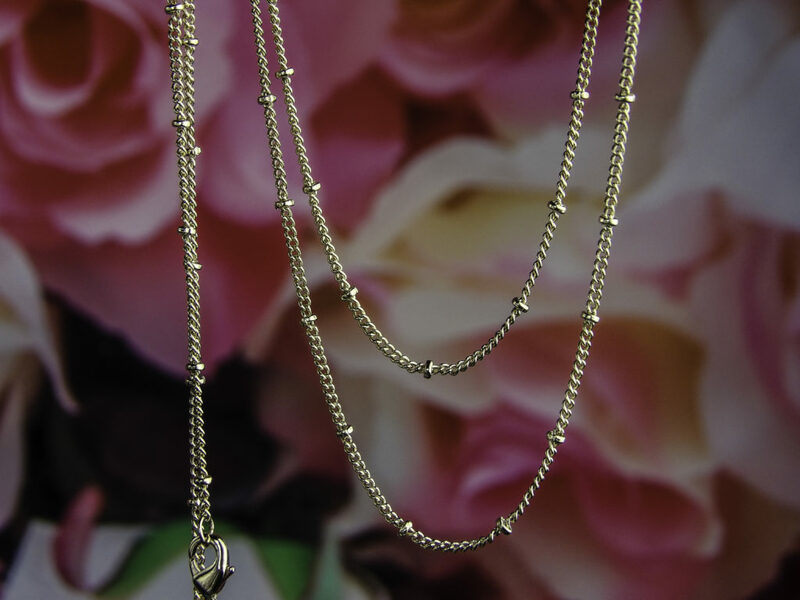 The chain is 30 inches with interval gold small bead-like links every few inches. It is a subtle design feature that adds some interest to the chain while not overpowering the focal piece. 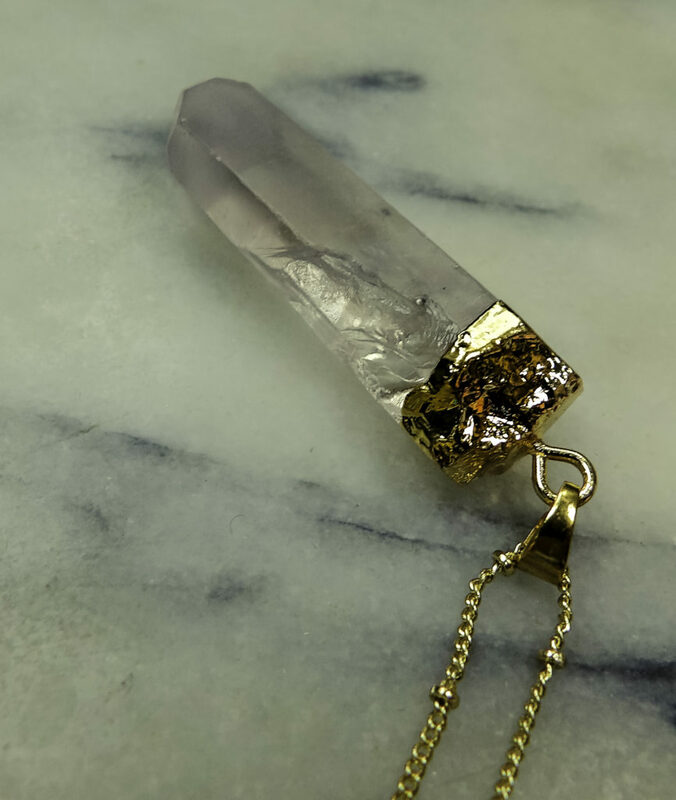 The crystal is held in place by a gold dipped copper band pendant on a chain. The clasp is a lobster clasp that is secure and sturdy. The chain is flexible and doesn’t catch on my hair or pinch my skin when it bends. 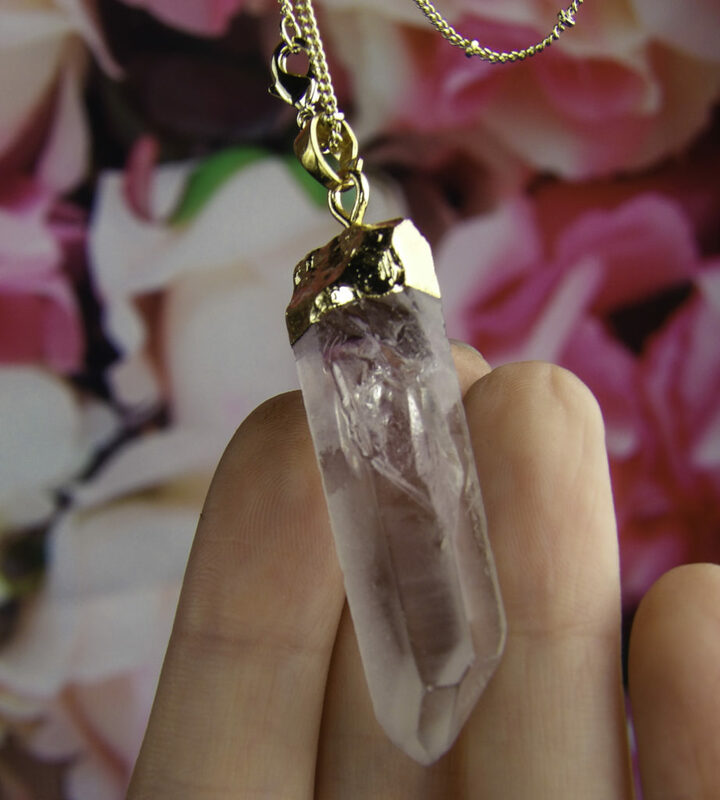 In addition to being a unique gift or piece of jewelry for your own collection, the crystal pendant can work as a long necklace, a pendulum or a balancing piece for room decor. 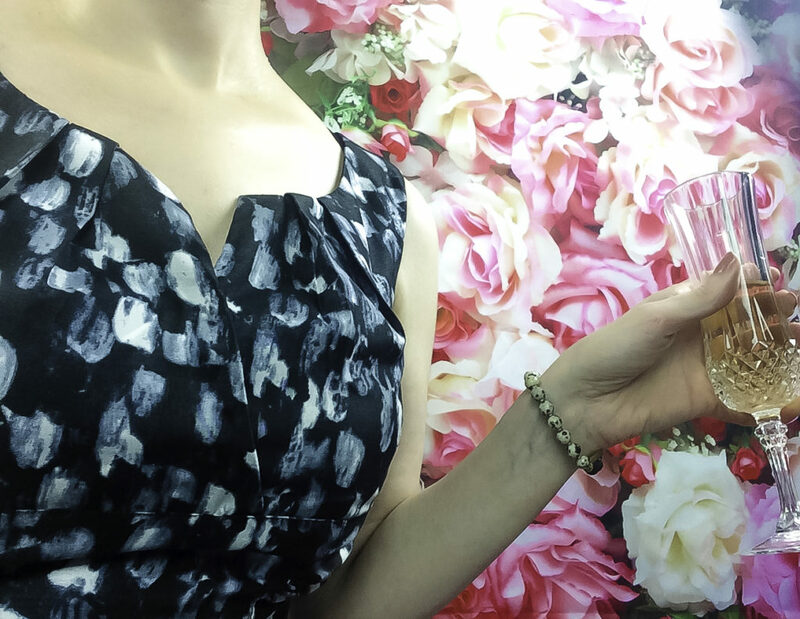 It goes with casual clothes or is suitable for a daytime dressy occasion event such as a garden wedding or reception. It looks good in outdoor and indoor lighting and reflects the light in a subtle way, not blingy. The necklace arrives well packed for shipping and comes in a drawstring plush velvet pouch bag with the BoutiqueLovin logo on one side. 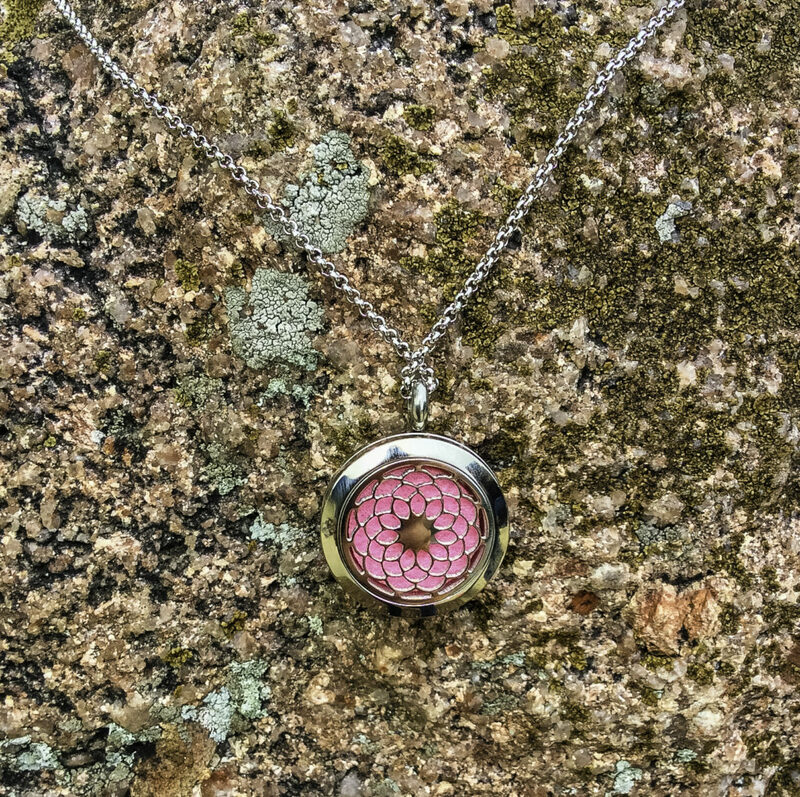 It is ready for gift giving, this necklace is ideal for your boho chic friend, as a bridesmaid gift, for a teen or nature-loving friend or a friend who loves distinct pieces of jewelry that by their nature have one-of-a-kind pieces. 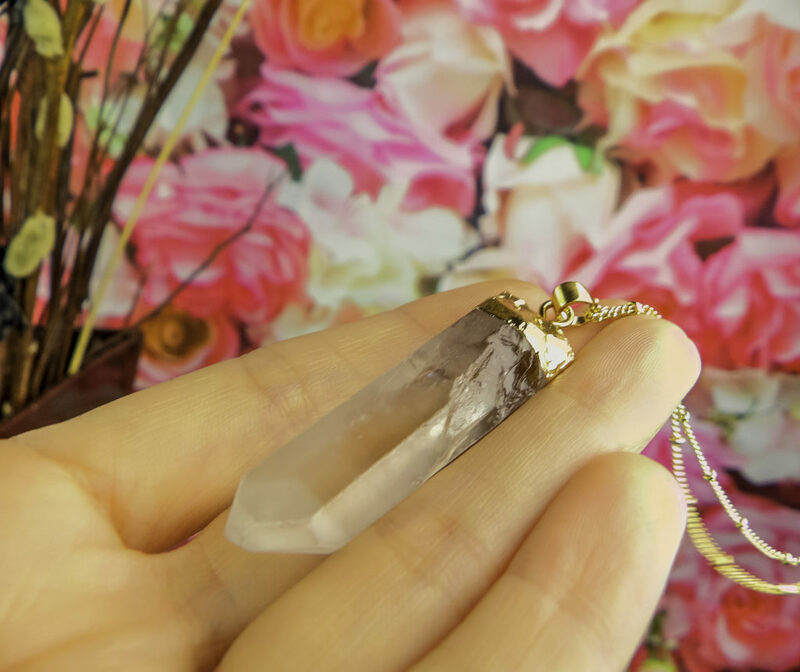 A piece for someone who loves natural pieces yet enjoys distinctive design, this raw quartz crystal works with both casual and dressy clothes and compliments many outfits. 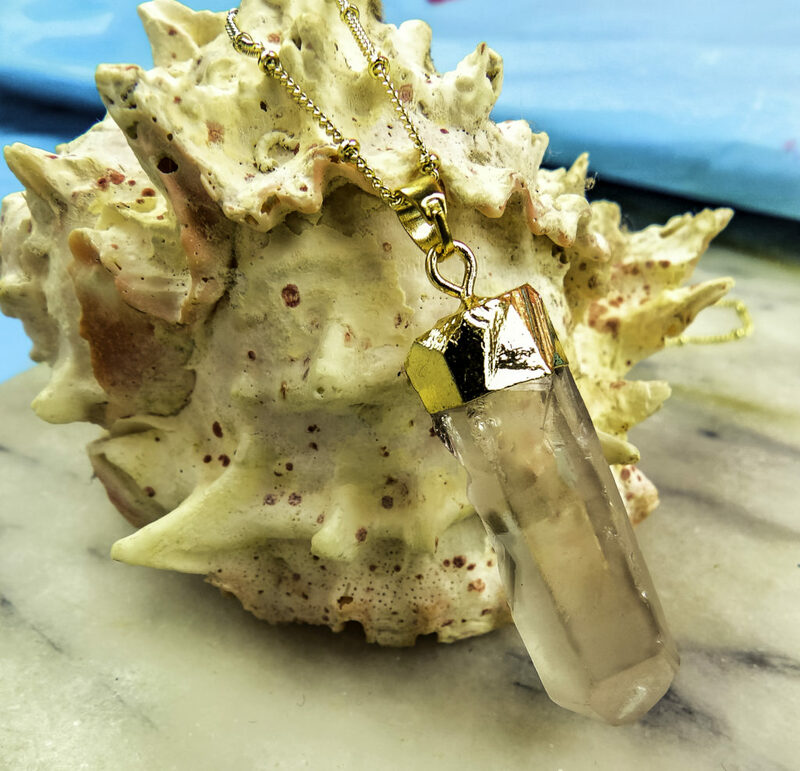 A well-made piece of sturdy construction, it makes an ideal gift for someone who loves minerals, crystal quartz, or natural gifts with a distinctive look. Each piece is unique and contains natural variances, structures, and shapes which lend to its natural beauty. 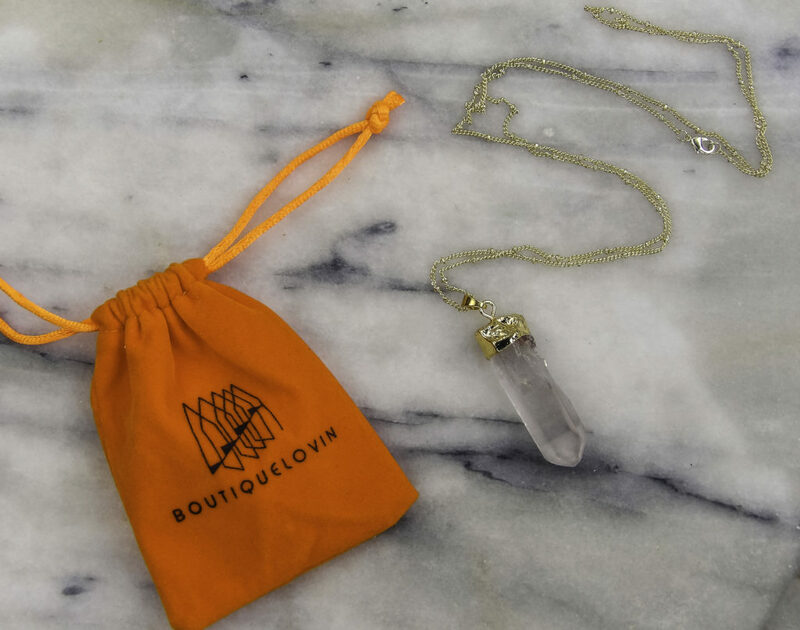 Style Chicks received the BoutiqueLovin Gold Dipped Clear Quartz Gemstone Pendant necklace in exchange for our unbiased review and received compensation for our time and effort. However, our experience with the product and the opinions expressed in this review are 100% ours. Aromatherapy is a powerful way to impact the senses. Essential oils can calm or invigorate, uplift a mood or enhance mental clarity and concentration. Essentials Oils are easily enjoyed from home with the use of diffusers, but wouldn’t it be helpful to harness the power of essential oils when away from home such as at school, when traveling, exercising, or during the work day? Wish you could carry the benefits of essential oils with you wherever you go? You can with LovePray Essential Oil Diffuser Bracelets. 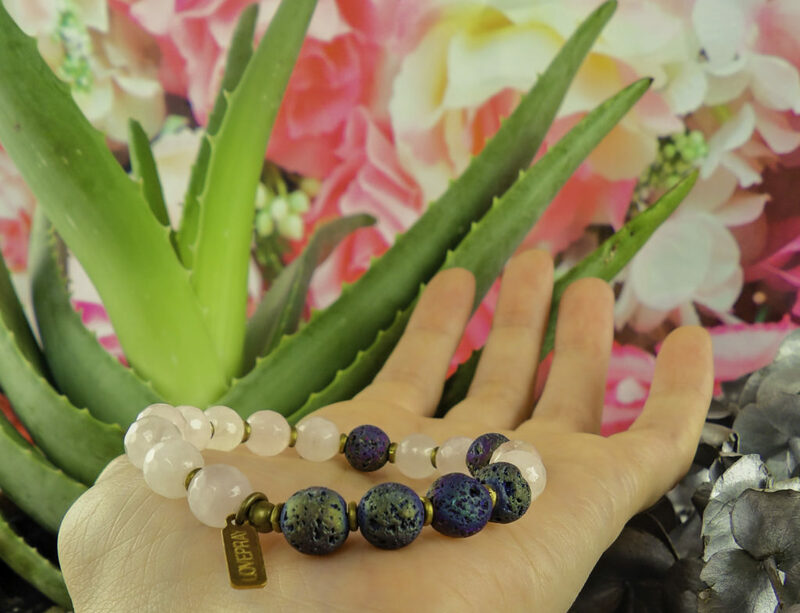 LovePray Essential Oil Diffuser Bracelets are made with genuine gemstones and lava beads to diffuse the essential oils of your choice throughout the day. 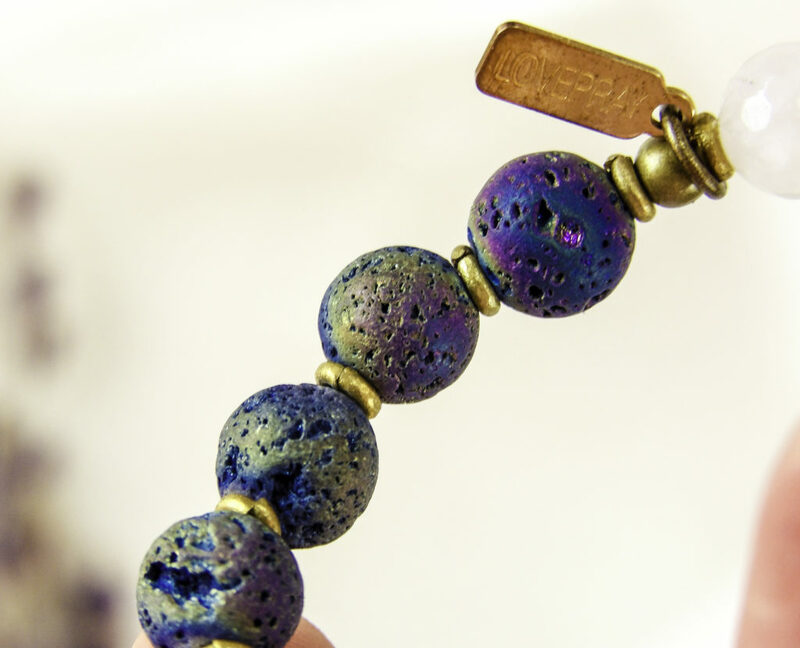 The Lava beads are porous and thereby retain and slowly diffuse any added essential oils. They last throughout the day without leaking or staining clothing or other jewelry. 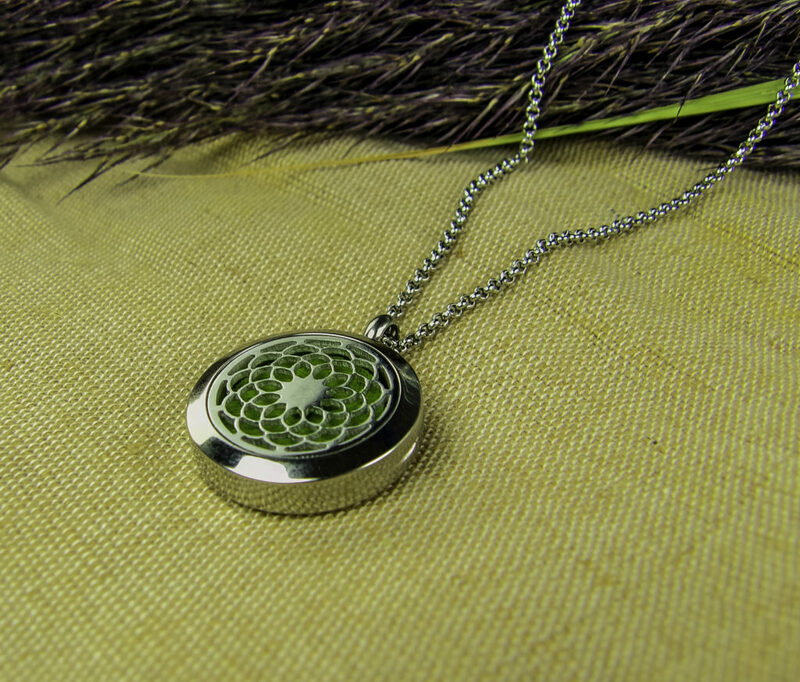 Get personal aromatherapy wherever you go from an attractive, intricate piece of jewelry. Close up of the beautiful lava beads, love the natural purple and green peacock iridescence in the light! The porous beads hold essential oils all day. 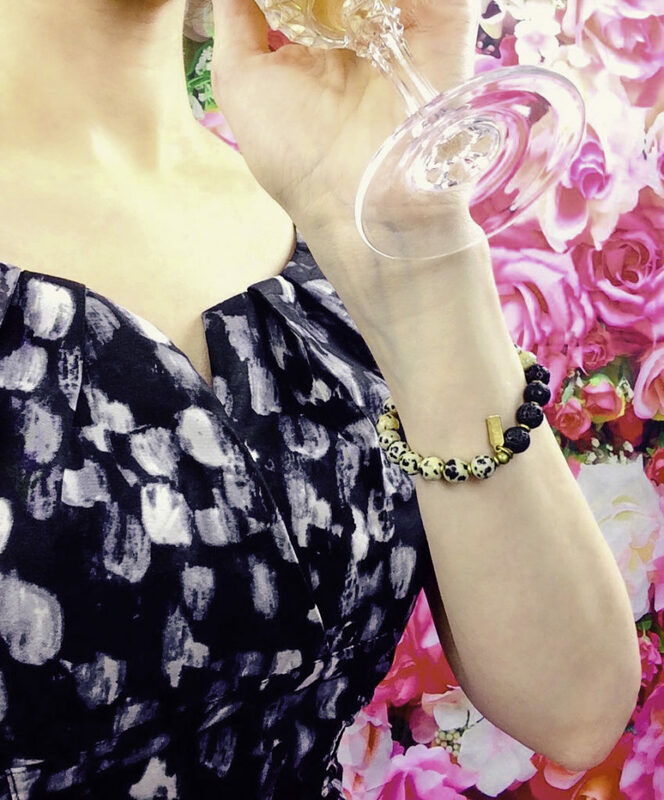 As seen here on the Rose Quartz bracelet. 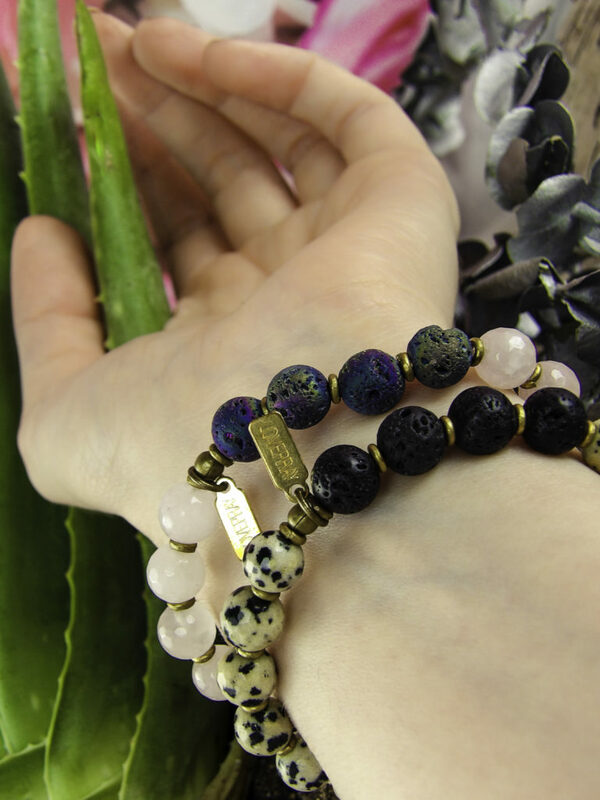 LovePray Essential Oil Diffuser Bracelets are well made and are attractive pieces, each with a unique artisan style. 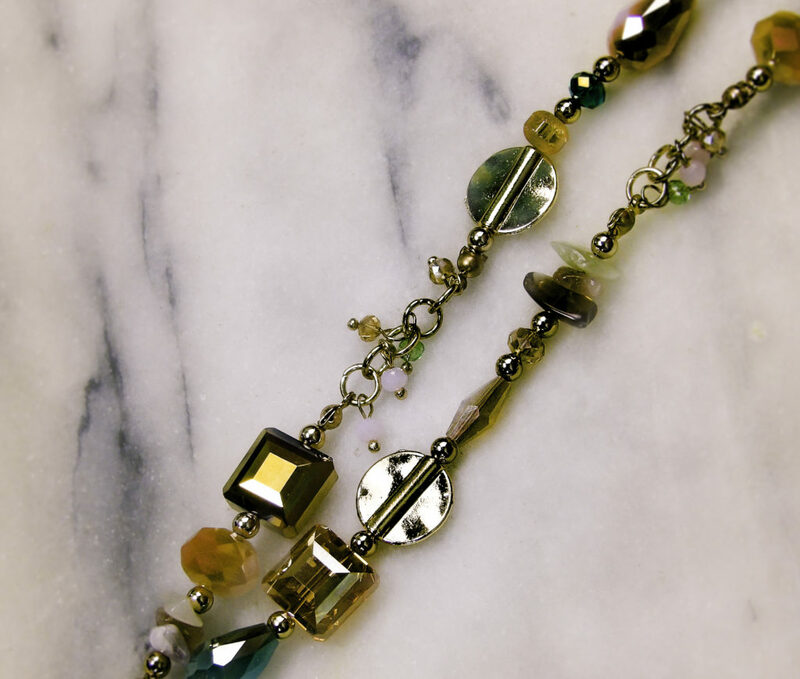 They come in several highly versatile colors and varieties of gemstones to mix and match with your wardrobe. Gemstone choices include colorful and vibrant Onyx, Amethyst, Jasper, Tiger’s Eye, Amazonite, Rose Quartz, Mookalite, Sunstone, Rose Crystal, Howlite, and Damalatian Jasper (black and white spotted). The bracelets are versatile pieces that go with both casual and dressier outfits. 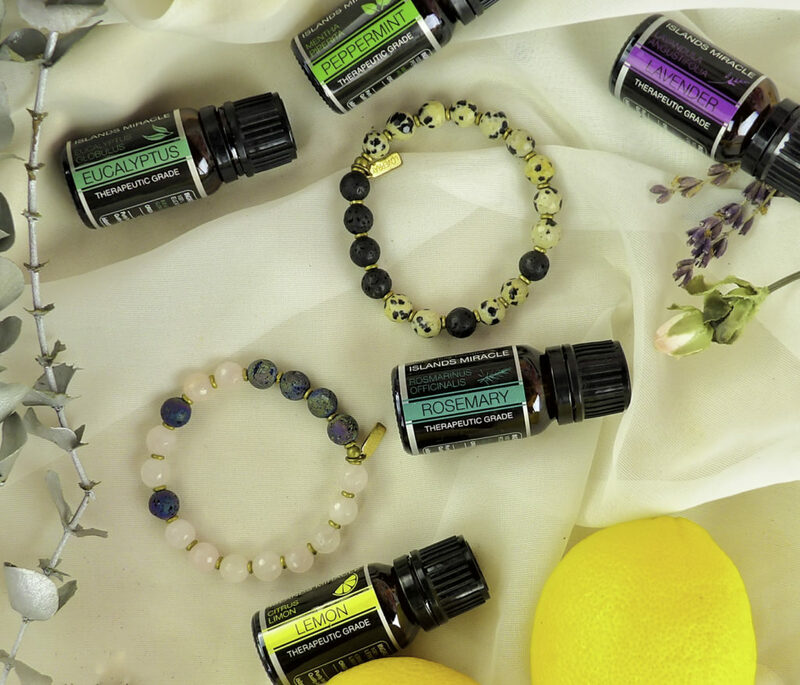 These LovePray Essential Oil Diffuser Bracelets enable having a custom essential oil blend, or a natural, simple scent by providing the power of essential oils on the go. Oils applied directly to the skin can stain clothing and may cause an allergic reaction. You may also at times be in a scent-free zone, such as some work environments or doctors offices, so the ability to remove your diffusing bracelet as needed is a way to still wear a scent even if you must briefly be in a scent free environment. Lastly, the oils’ scent being diffused on the lava beads outlasts direct skin contact, diffusing just a drop or two of oil evenly throughout the day. Apply the essential oil or a blend of oils directly to the lava beads. I found the beads to hold the scent and have impressive essential oil diffusing properties for several hours. Only a drop or two is needed to last throughout the day. Once the scent dissipates, a different oil can be used the next day if desired. Add a drop of the essential oil or oils of your choice to any lava bead for diffused essential oil benefits that last all day! Grapefruit essential oil is both stimulating and uplifting. Don’t feel like going to the gym or can’t relax enough to concentrate on your form or to get a good stretch? Exercises such as Yoga, Pilates, and stretching are enhanced by the uplifting scent of Grapefruit Oil. Grapefruit also enhances concentration. BONUS: The scent of Grapefruit makes people perceive you as younger than you actually are. 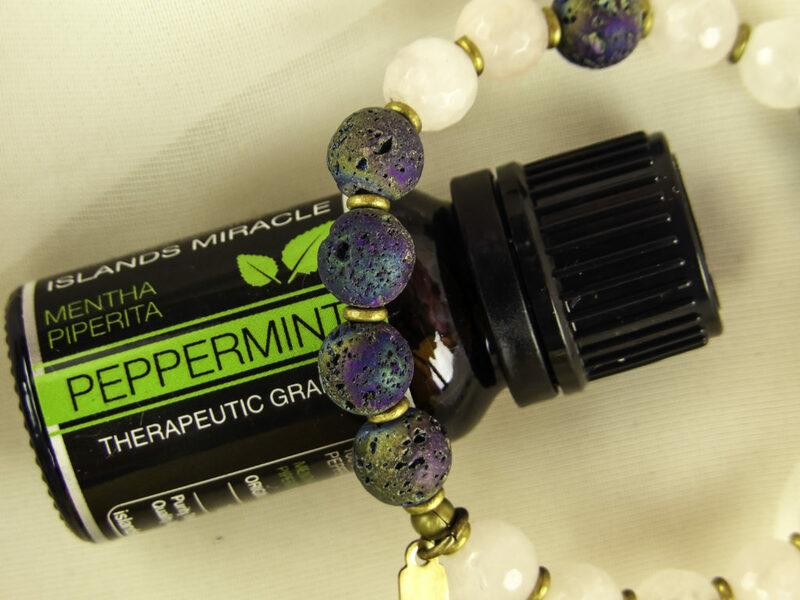 Peppermint Oil infused on the LovePray Essential Oil Diffuser Bracelets is invigorating and aids with mental clarity. It’s beneficial when studying, or concentrating on a project or school exam. Studying at the library or learning a new skill? 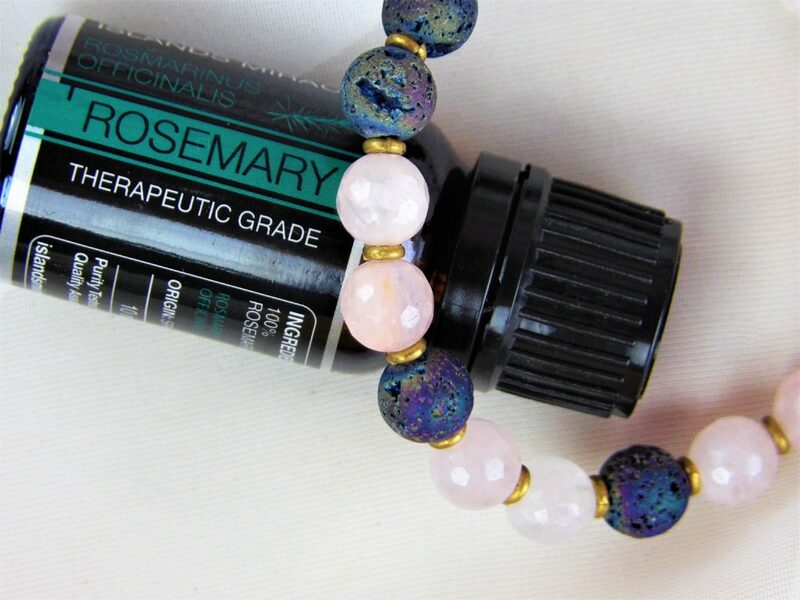 Try Rosemary essential oil on your bracelet. Diffusing Rosemary Oil can also be helpful, it is reputed to help students concentrate while doing their homework or learning. Rosemary Essential Oil is a calming oil that helps with nervousness and fatigue, yet it still improves mental clarity, especially when under stress, like during a presentation or tense staff meeting or when one is overworked and facing a looming deadline. Does your office or classroom have forced air heating or air conditioning that makes the environment very dry? 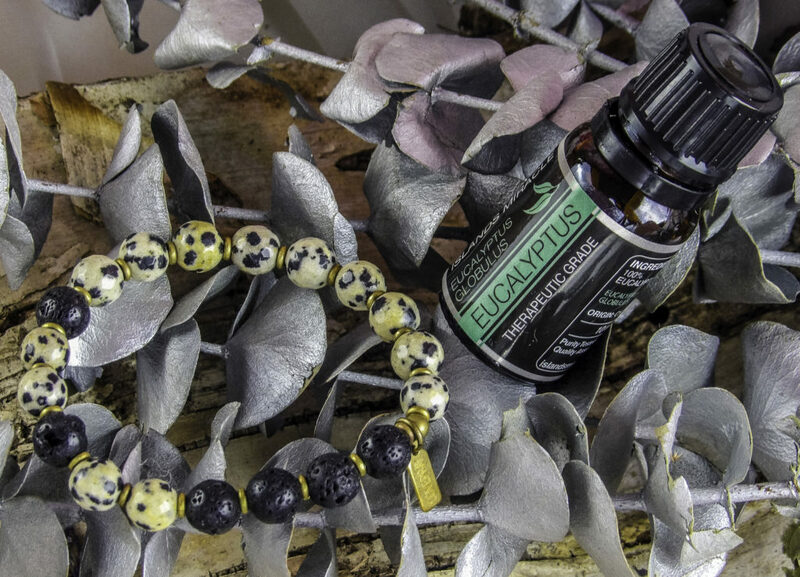 Try applying Eucalyptus essential oil to the LovePray bracelet for combatting overly dry offices, especially during allergy season, or when recovering from a cold. Wedding season is here, and while outdoor receptions and ceremonies at sunset are picturesque, they are also bug-ridden. Don’t want to wear a chemical-filled, foul-smelling bug spray to a wedding, al fresco dinner party, or picnic? 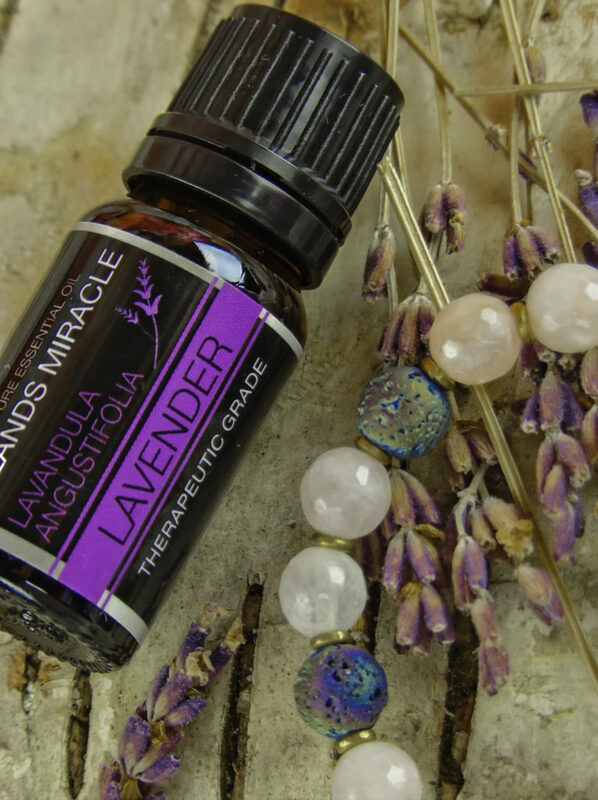 I found this to be a perfect time for a LovePray Essential Oil bracelet because it’s a pretty way to keep the bugs away! Tea Tree Oil deters bugs and ticks and is useful for camping, hikes, and picnics when bug spray is not an option. Peppermint Oil also deters bugs, as does lemongrass. Citronella oil is also highly effective. My pretty LovePray diffuser bracelet diffused with Peppermint Oil saved me from the bugs biting me at a recent outdoor wedding! I love not smelling having to smell like bug spray at a formal event! Going out to eat with friends, you want to be social but not completely ruin your diet? Try Peppermint Oil, Grapefruit or Lavender on your LovePray Essential Oil Diffuser bracelet to curb excessive over-eating. TIP: Discretely directly inhale the scent of the infused beads immediately before reading the menu and ordering for an extra boost of essential oil inspired self-control. Use a single scent such as Lemon, which is invigorating, smells clean and is considered a universally pleasing, or blend a few oils together for your own signature scent. What is your favorite essential oil combination? Based in San Diego, California, all LovePray jewelry is original, designed and made in their studio using ONLY responsibly sourced, fair-trade, cruelty-free materials and gemstones. 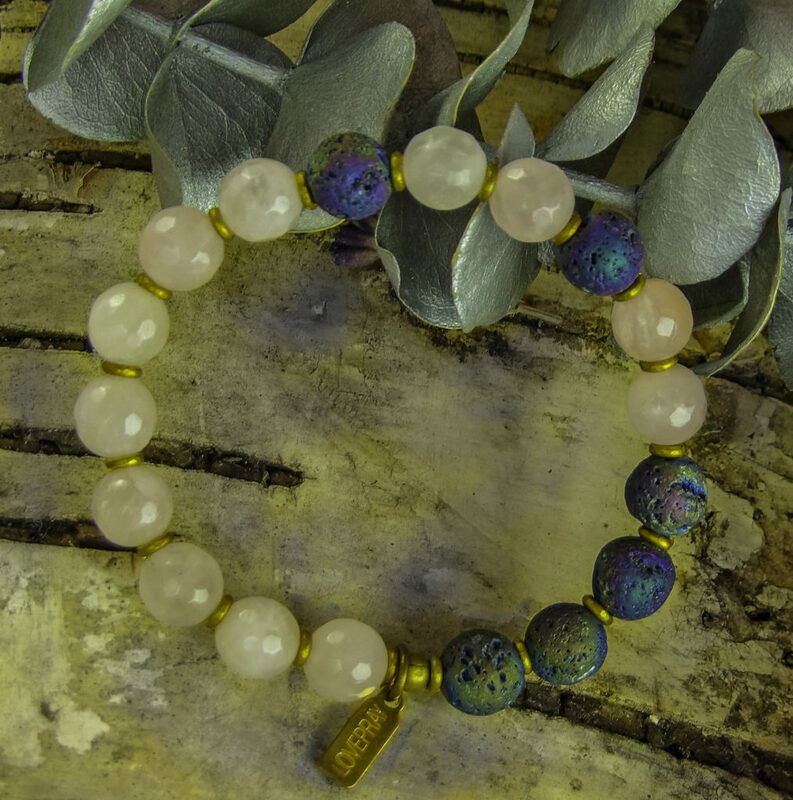 In addition to the wide selection of colorful Essential Oil Diffuser bracelets, they carry a full catalog of beautiful, unique handmade jewelry. Right now, LovePray is having a sale! And exclusively for StyleChicks readers, get 20% off LovePray jewelry with coupon code STYLECHICKS20 (Expires Sep/30/2017). LovePray Essential Oil Diffuser Bracelets easily dress up or down, formal or casual. Like this look? 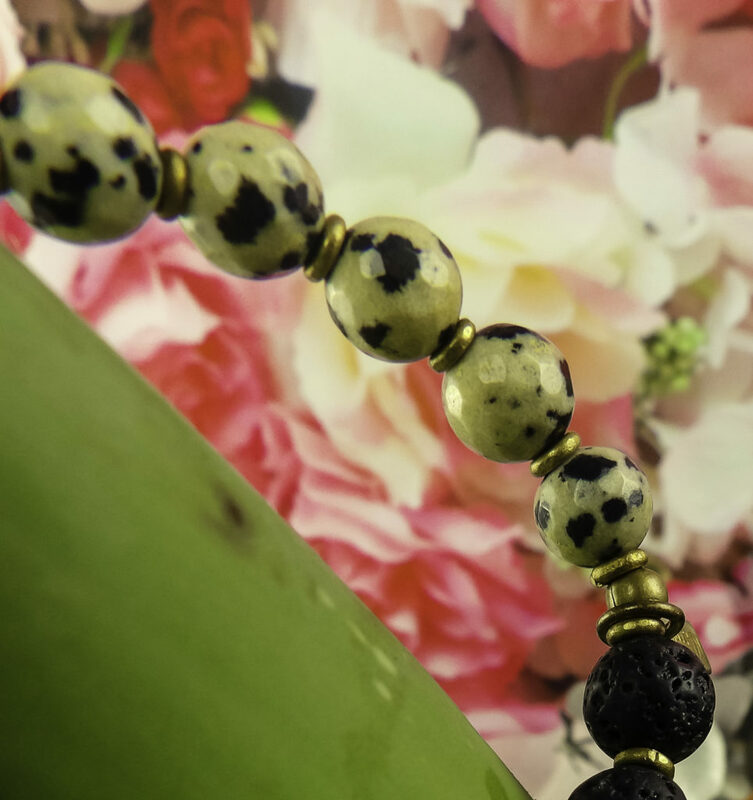 It is the Dalmatian Jasper, such a versatile piece! Style Chicks received the LovePray Essential Oil Diffuser Bracelets in exchange for our unbiased review and received compensation for our time and effort. However, our experience with the product and the opinions expressed in this review are 100% ours. Do you enjoy wearing a piece of jewelry that is distinctive and modern but still has an overall classic look? Are you looking for a unique, artisan piece of jewelry for yourself or as a gift? 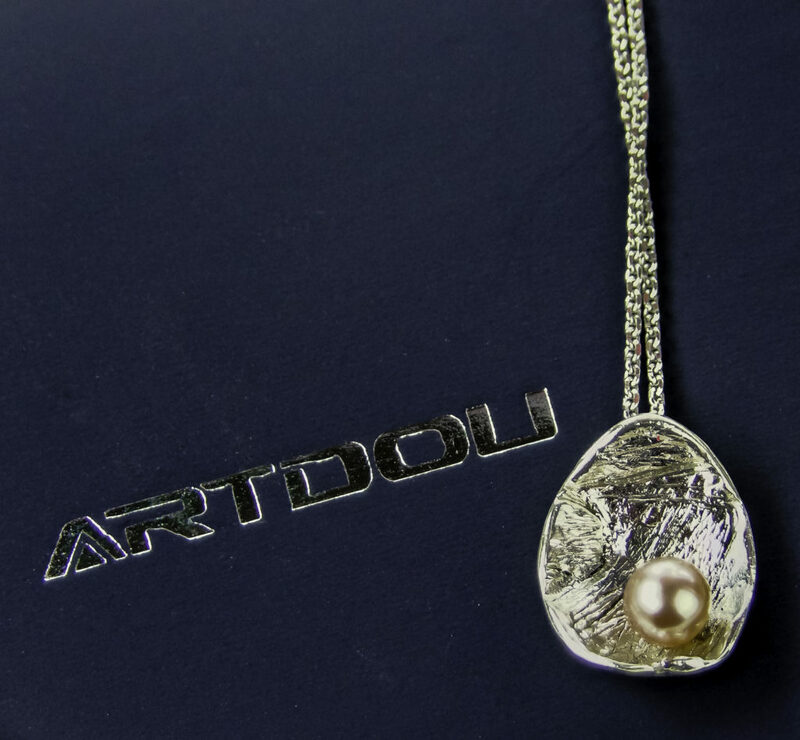 Consider a handcrafted piece from ARTDOU, such as this Pearl and Lotus Leaf Pendant Necklace. 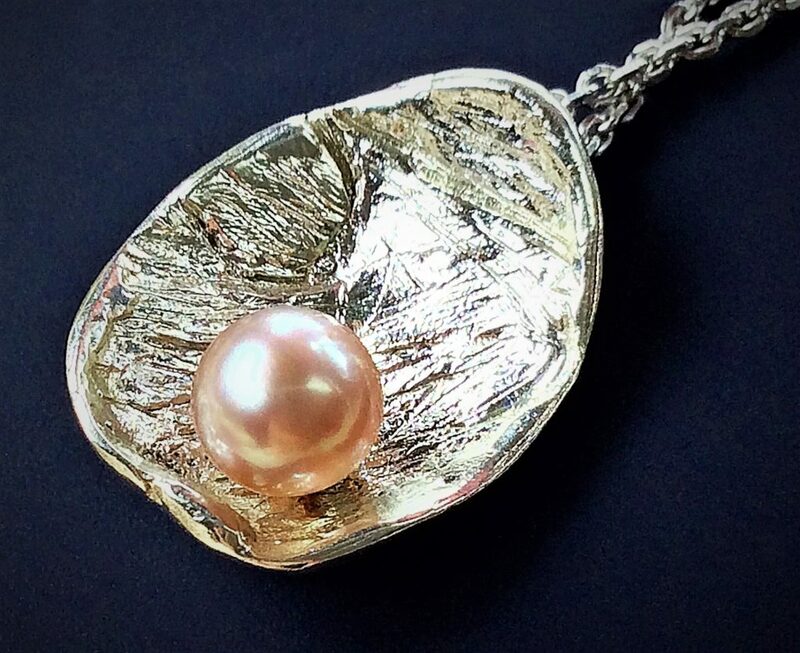 The ARTDOU Pearl and Lotus Leaf Pendant Necklace is ideal for those who curate elegant, high-quality pieces for their jewelry collection, or for a friend, sister, mother or bridesmaid who finds inspiration from nature-themed elements. 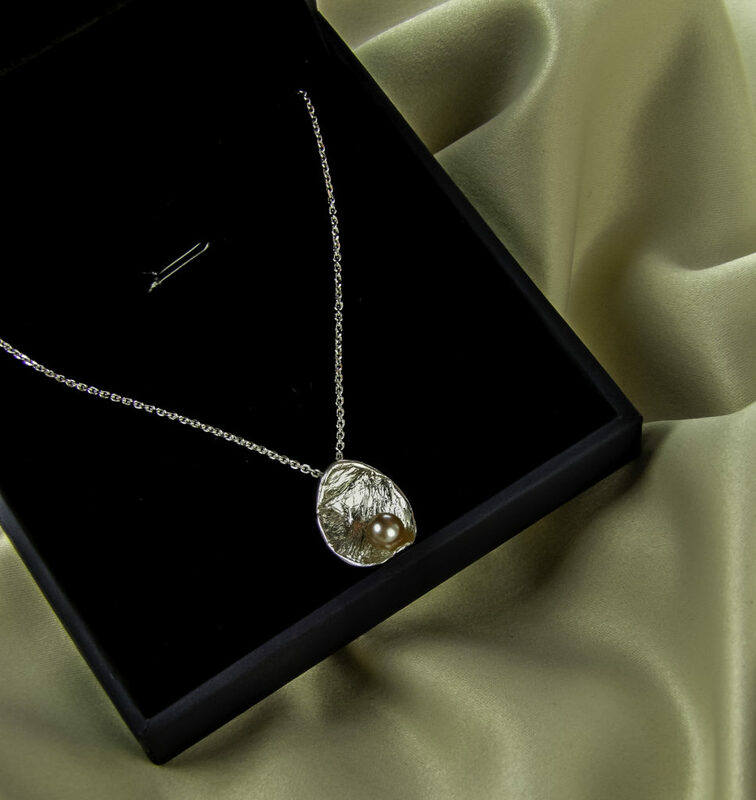 This distinctive pendant necklace is an elegant piece, created with attention to detail. 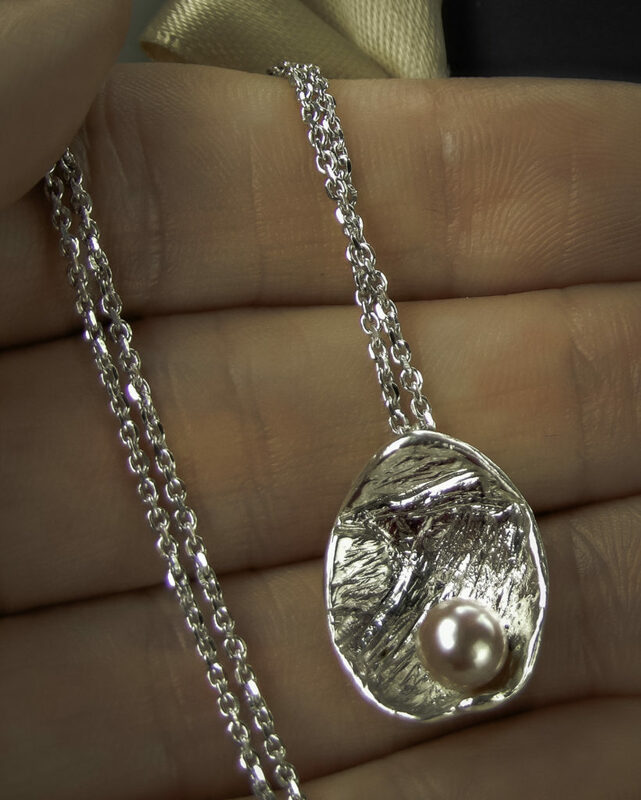 Made entirely of pure premium .925 sterling silver and adorned with a natural pearl, the hypoallergenic necklace is completely lead-free, nickel-free, Cadmium-free, so it can be worn even by those with sensitive skin. 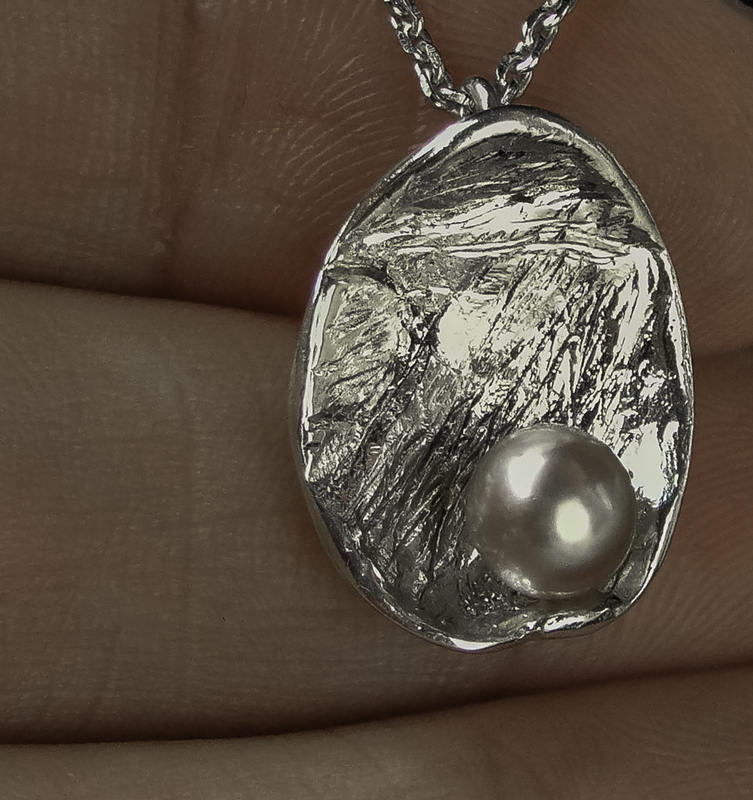 The focal piece is a lotus leaf of a handcrafted, textured, rough silver and accented with a small natural and smooth pearl. The combination of the two textures has a modern and clean vibe but a classic and feminine feel at the same time. The focal piece itself is about 3/4 of an inch high and a little more than half and inch wide. Overall, the piece is delicate in appearance but noticeable to the discerning eye. 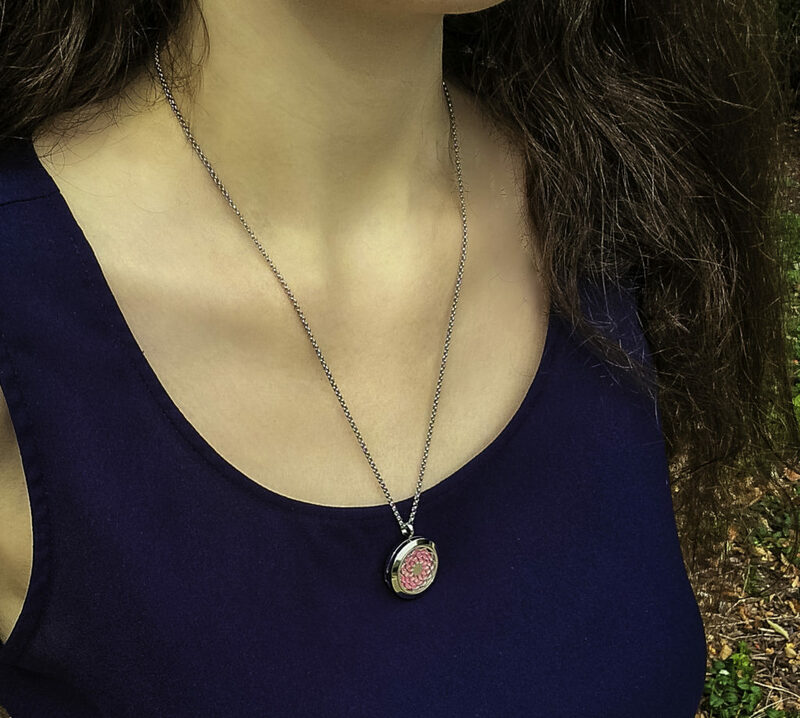 When I wear it, it doesn’t scream for attention but frequently, after a few minutes of talking to someone, they often comment on the necklace and want to take a closer look. 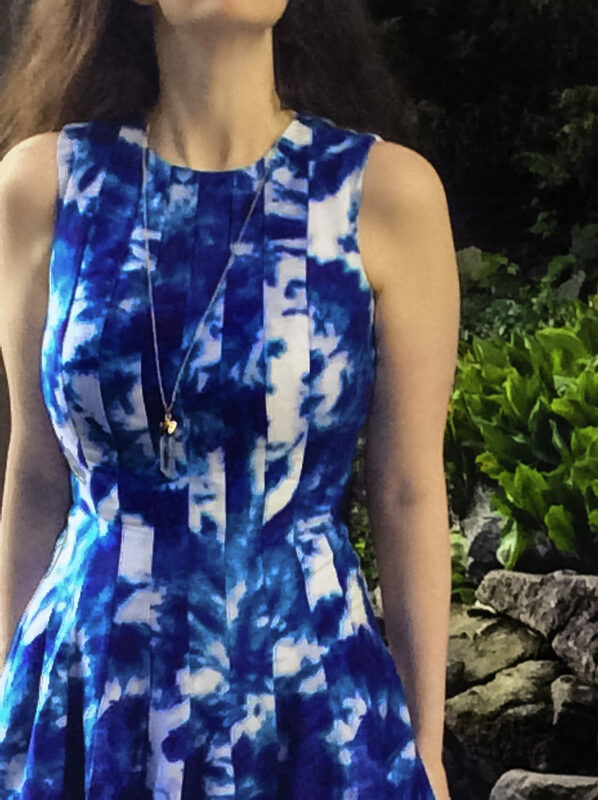 I like having a unique piece like this that doesn’t look the same as what everyone else is wearing, but is not outlandish and still looks appropriate for various occasions. Despite appearing delicate and feminine, it is a durable, solid piece that is highly resistant to damage or wear. I particularly like that this piece not only has a focal piece of quality materials and construction but that the 18″ chain is also of high-quality. The spring closure clasp is solid and has about an inch of adjustable chain for an extra drop in length if desired. This easy to care for necklace comes in an attractive, velvet lined gift box that is sturdy enough to be suitable for permanent storage. 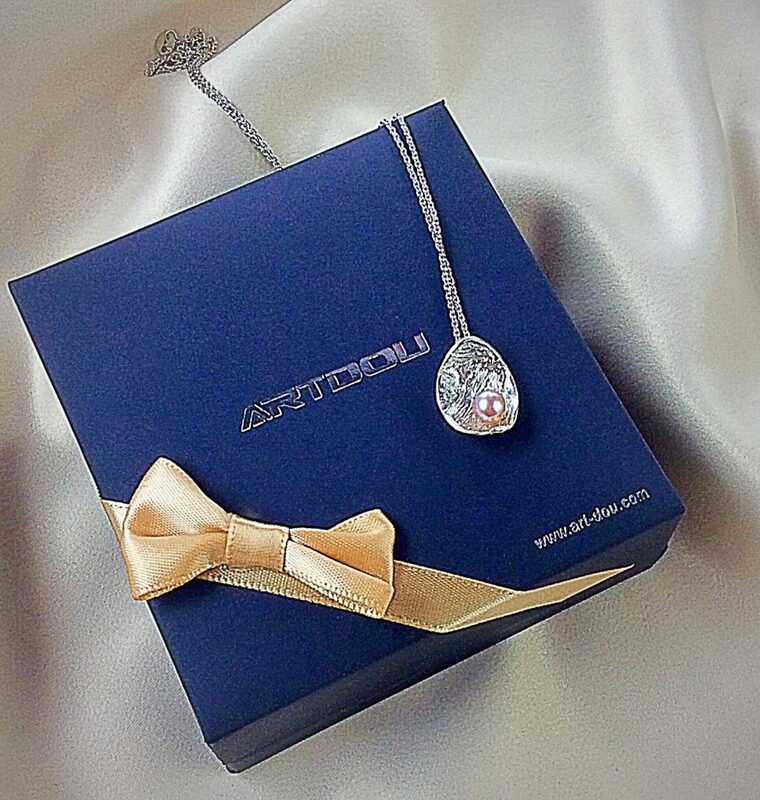 It has the ARTDOU logo on the top of the hinged box, and an attractive corner gift bow. The gift box comes in a white cardboard sleeve over the box and is well wrapped in plastic overwrap so the gift box arrives in giftable condition without damage. 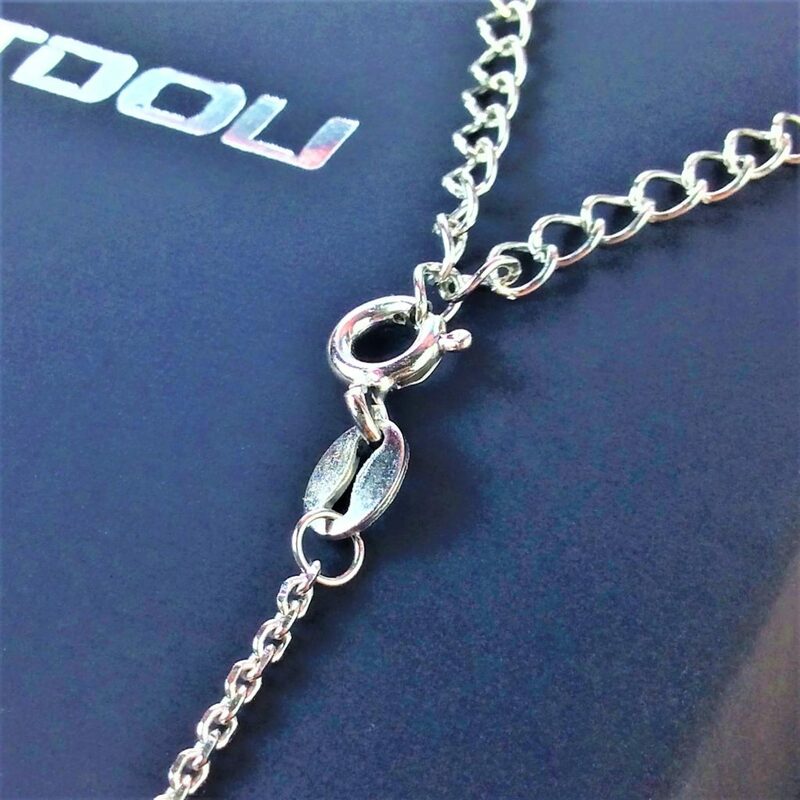 The necklace also comes with a small envelope containing a silver polishing cloth to keep the pendant necklace tarnish free for years to come. I particularly like that ARTDOU jewelry successfully blends the materials of classic designs into clean, modern yet original and detailed designs that have an artisan flare but are elegant enough to be worn to formal events such as a wedding or dressy occasion, but the pieces are still simple and clean enough to also work as an everyday signature jewelry piece. 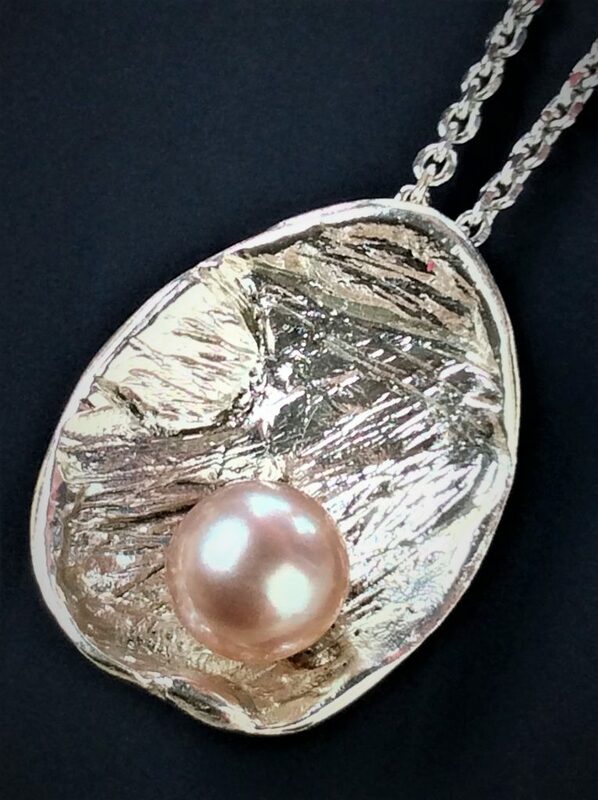 Also noteworthy is the use of a single lustrous and natural pearl. Designing the necklace with a pearl as an elegant accent is feminine without being stuffy, too prim, common, dull or old-lady-ish. There is a clean modern aesthetic to the piece incorporating natural motifs with classic elements like a pearl on an artisan crafted leaf or flower. A lovely gift for someone who likes to combine modern and classic styles with a feminine and natural appeal, this high-quality piece makes a thoughtful gift that will be stylish and last for years to come. 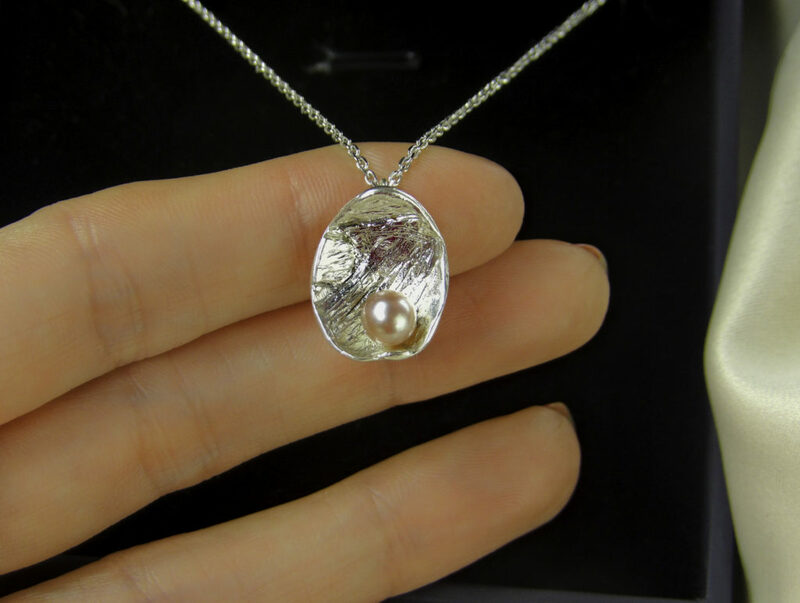 Style Chicks received the ARTDOU Pearl and Lotus Leaf Pendant Necklace in exchange for our unbiased review and received compensation for our time and effort. However, our experience with the product and the opinions expressed in this review are 100% ours. Ever have the perfect outfit planned for work, a seminar or a conference that is ruined by having to wear a badge or nametag? How about those photo ID lanyards, typically made of that plastic-y bungee cord woven material that looks like it belongs at an amusement park? 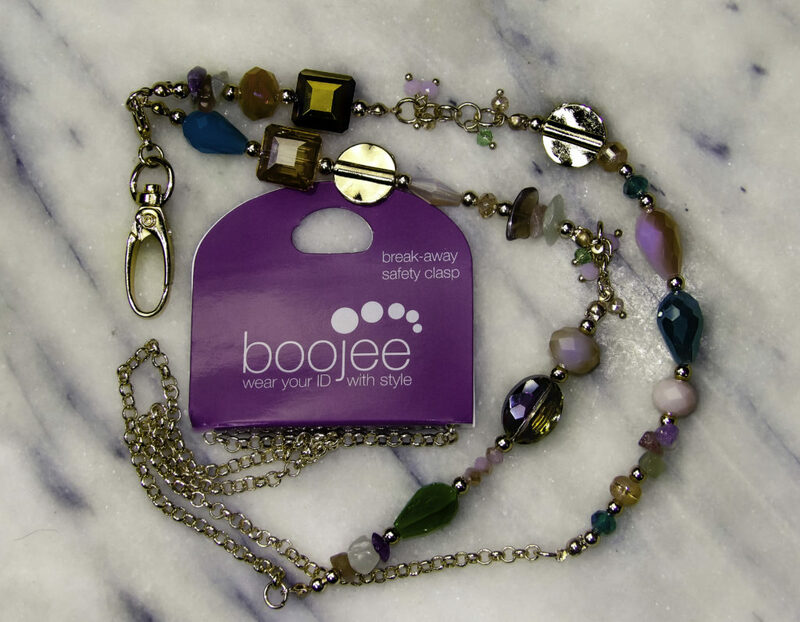 Consider instead a unique, professional, attractive yet sturdier option of a Boojee Beads Chain Fashion Lanyard. Many of us go to conferences and symposiums that require some ID or name tag, which is frequently supposed to be pinned to our clothing, which tends to leave a mark or tiny pin hole. Even though everyone else at the conference is wearing them, a lanyard or lapel badge tends to be uncomfortable and cumbersome. Many large campus work settings such as hospitals require displaying photo IDs at all times to gain access through secure doorways, requiring that some sort of lanyard is worn during work hours. 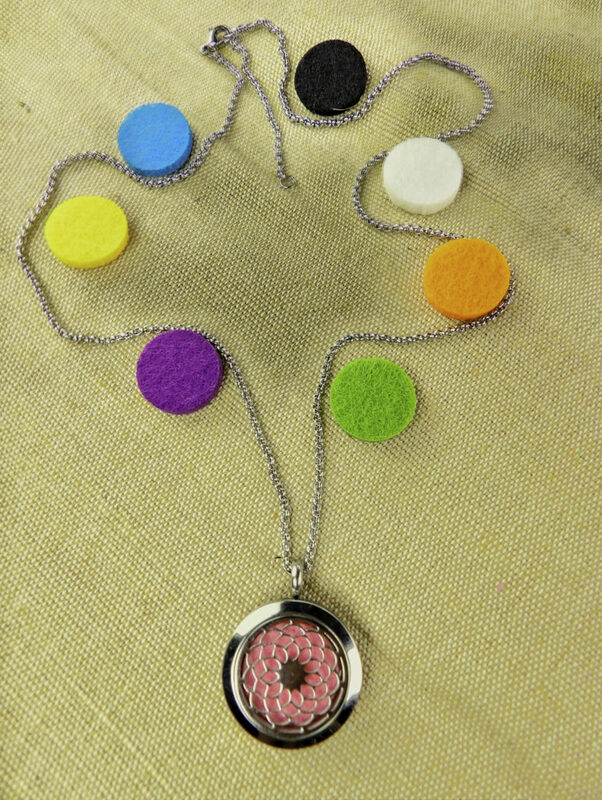 Boojee Beads makes attractive lanyards that are styled like necklaces with attractive beads in various shapes and colors. 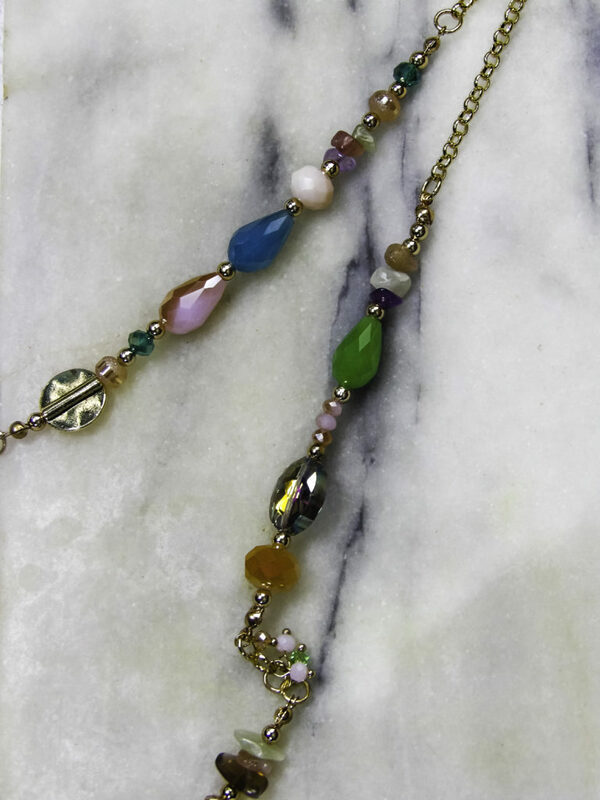 We like the Boojee Beads Pastel Party Chain Fashion Lanyard because it has so many pretty colors that coordinate with spring and summer colors. If you tend to wear semi-precious stone rings, bracelets, earrings or other jewelry, the Boojee Beads Pastel Party Lanyard will coordinate with other gem and stone jewelry to make your ID less imposing on your general fashion style. 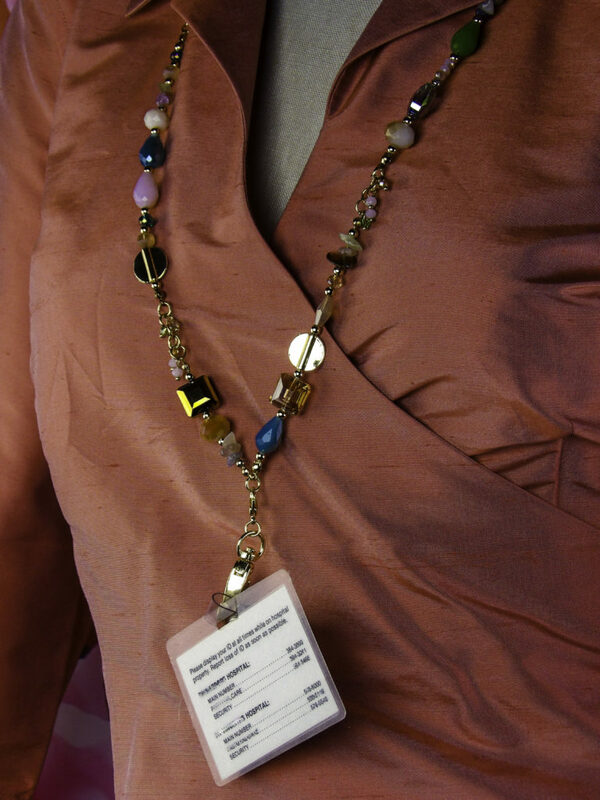 The Boojee Beads lanyard hangs 19″ from the back of the neck in order to display ID badges clearly yet not be cumbersome to movement. 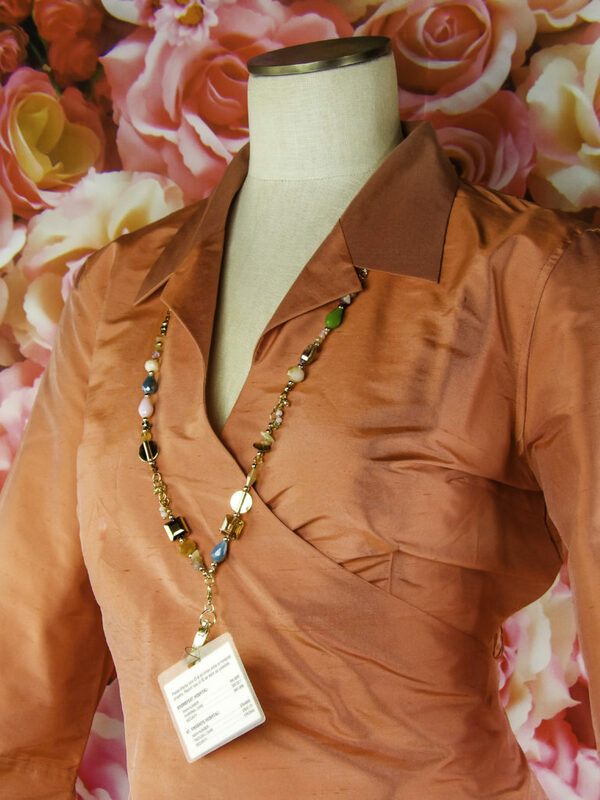 I like this length to not disrupt the line of my clothes, it appears and drapes like a necklace. 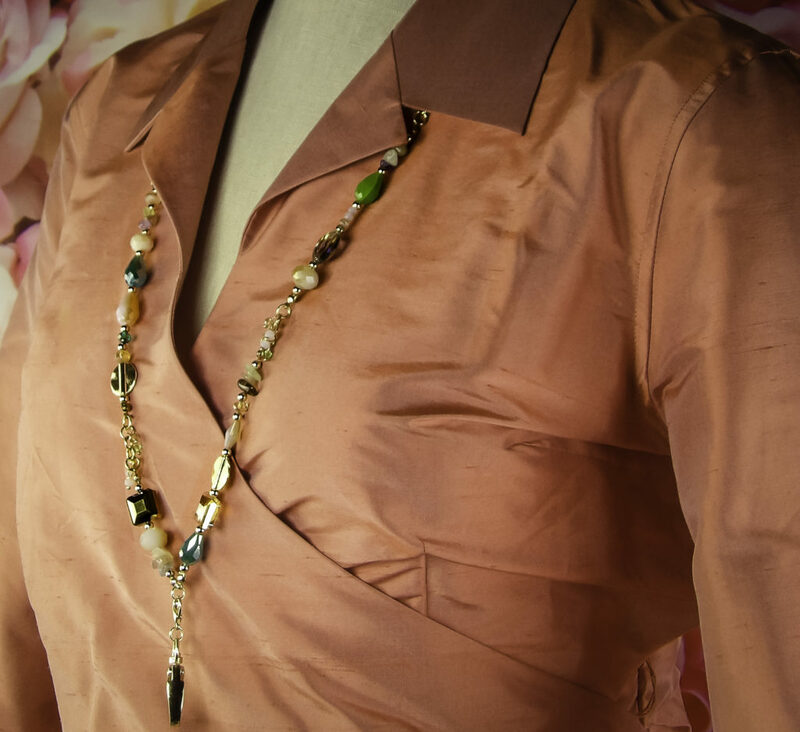 An attractive handmade piece, the various beads match several items in my work wardrobe and the colors and shapes add some sparkle and interest. There are some metallic pieces to add versatility. 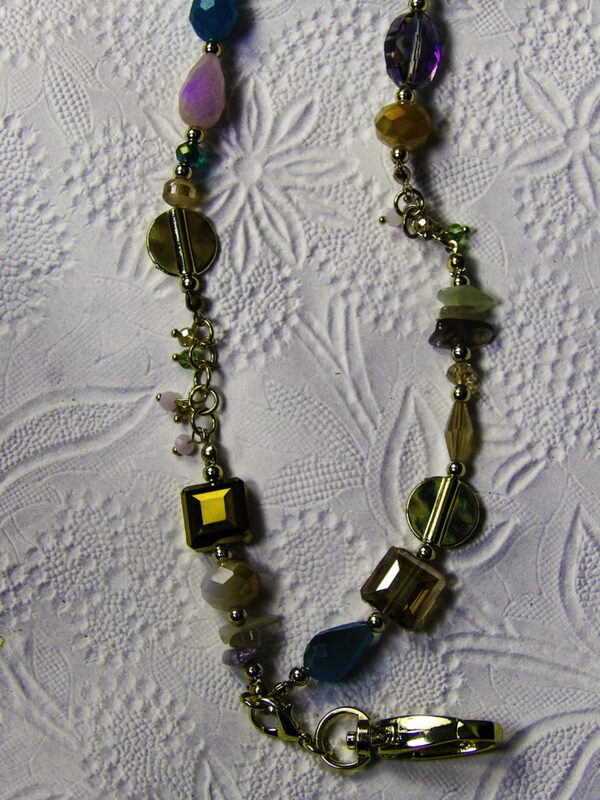 The beads coordinate nicely with pastels and brights. The breakaway closure is a safer option in crowds and elevators where a badge or ID may accidentally get tangled. These magnets are surprisingly strong and will connect if they are within a few inches of each other, and they really stay put! 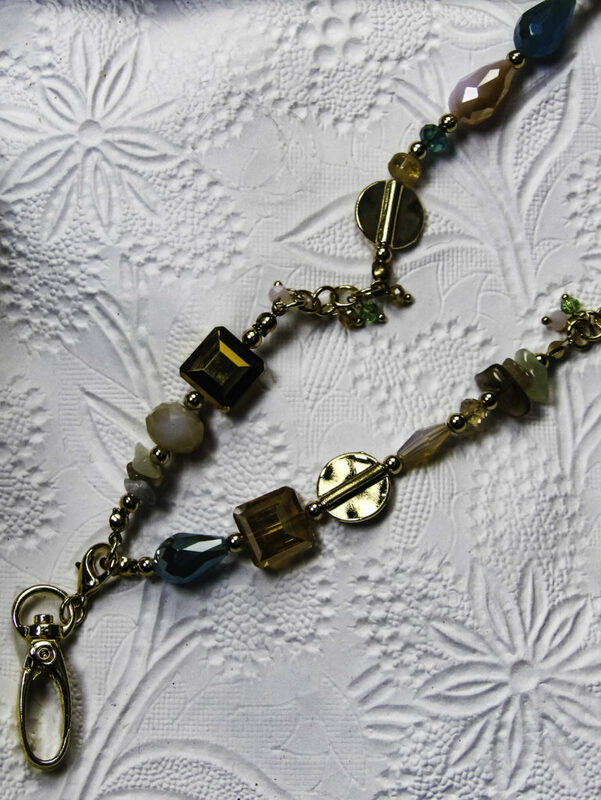 I like this as a clasp because it is sturdier than a traditional clasp and easier to use. There are colleagues you only see at annual conferences, and invariably it seems when someone hugs you, a name badge gets caught. Avoid this with a breakaway clasp chain. A sizable holder loop easily holds Photo IDs, keys, and lapel badges. It is simple to use, extra-large and secure. It is the same goldtone as the rest of the piece, so the ID is less obtrusive looking than standard IDs. The loop can be removed if one prefers not to wear just the necklace. I have a Photo ID at both work and at school, it is needed to open doors and to present at check points around both campuses. I found the lanyard to be comfortable to wear, it draped nicely and it didn’t scratch my neck like fabric lanyards tend to do. I was able to hold both IDs on the larger, sturdy ID hook. 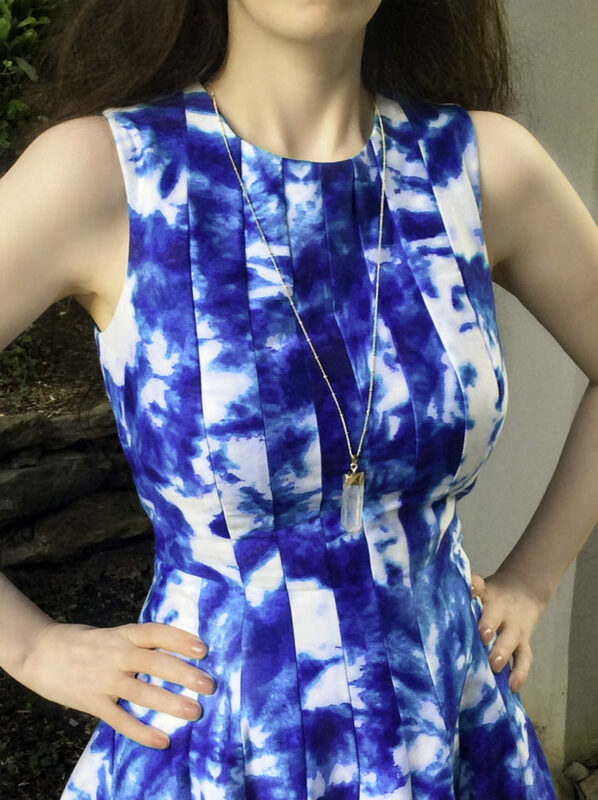 I like the length as I could wear a shorter necklace at the same time and it didn’t tangle. 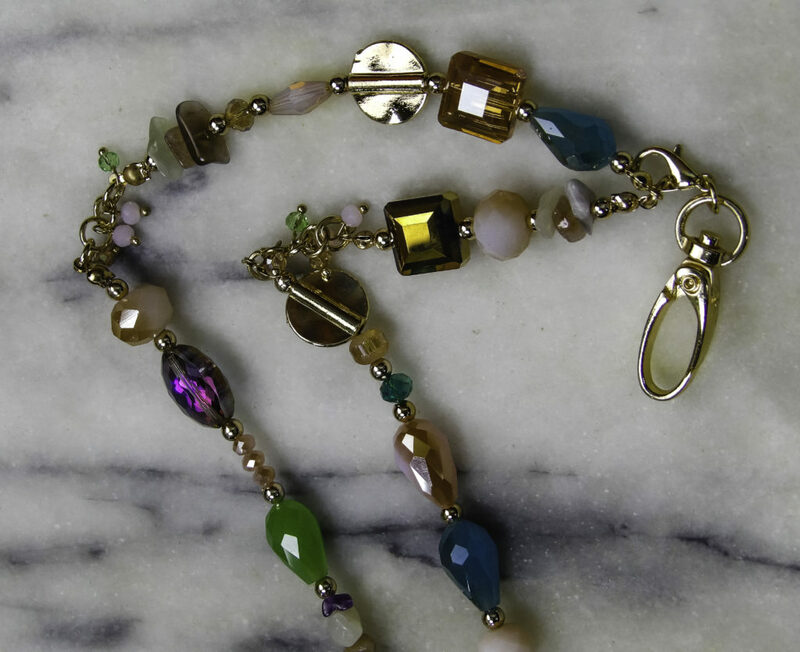 It all started when a Katie crafted a strand of beads for her mom, Lisa, a pediatric nurse. Lisa wore the beads to work with her ID clipped to the bottom. Other hospital nurses saw it and wanted their own lanyard. Lisa teamed up with her busy corporate career sister-in-law, Kimberly, who came up with the business plan that made this small at-home enterprise grow into a family business. 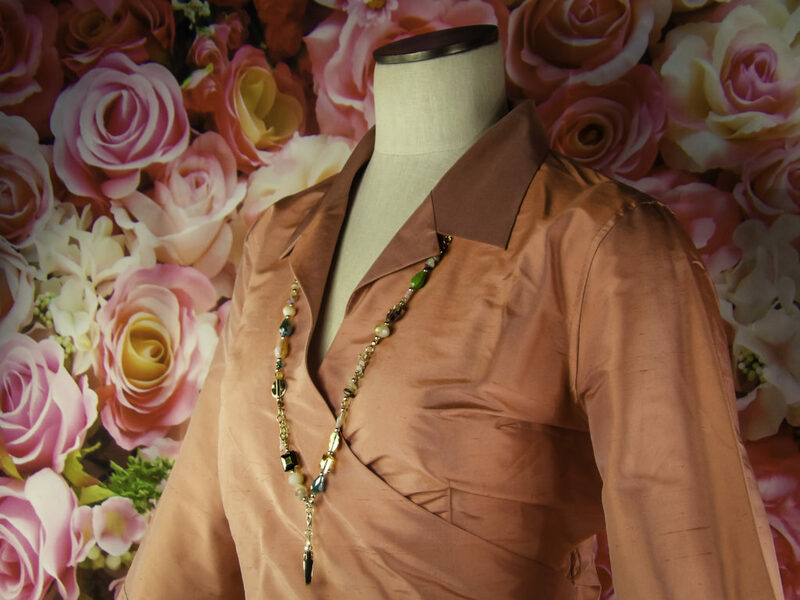 The Boojee Beads lanyard necklaces are still hand-crafted, and they are now part of a charmingly curated boutique full of innovative, useful products including badge reels and fitness jewelry. Boojee Beads is a Woman-Owned Business based that helps turn boring work IDs into a unique workplace style with hand-crafted beaded lanyards. 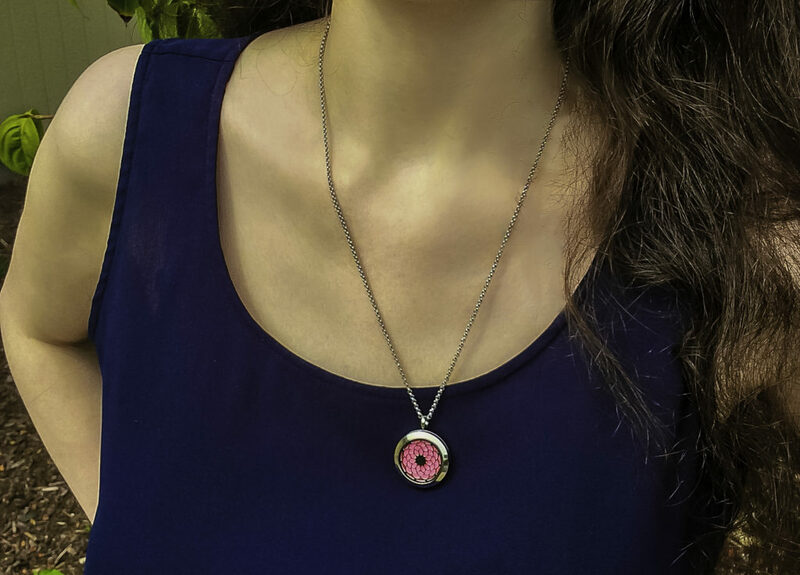 If you dislike looking like everyone else at work and want to show your own unique style, check out Boojee Beads creative ways to wear your photo ID. Style Chicks received a Boojee Beads Pastel Party Chain Fashion Lanyard in exchange for our unbiased review and received compensation for our time and effort. However, our experience with the product and the opinions expressed in this review are 100% ours.